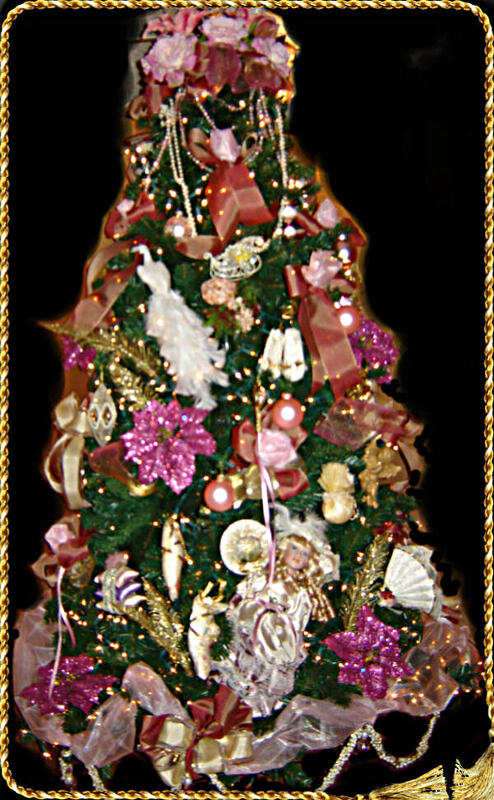 Decorated Themed Trees... click a tree to enlarge picture. 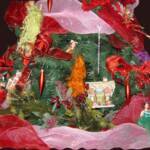 Scroll Down to see each themed predecorated or custom Christmas tree picture and order information for each one. 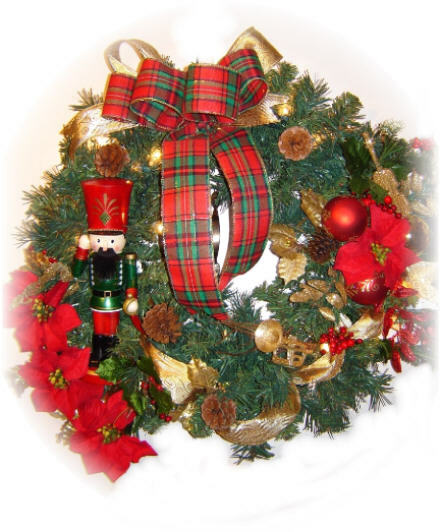 Decorated Christmas trees and wreaths are fully decorated to a theme and shipped to you, ready to display. 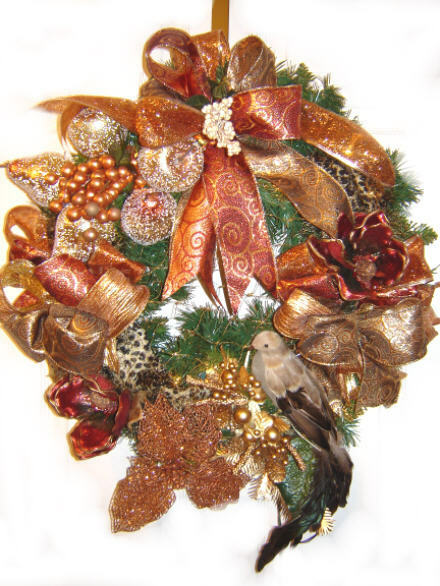 We design and ship fully decorated trees and wreaths and centerpieces, but if you prefer to purchase the decorations and decorate the tree yourself, we can help you with that too? 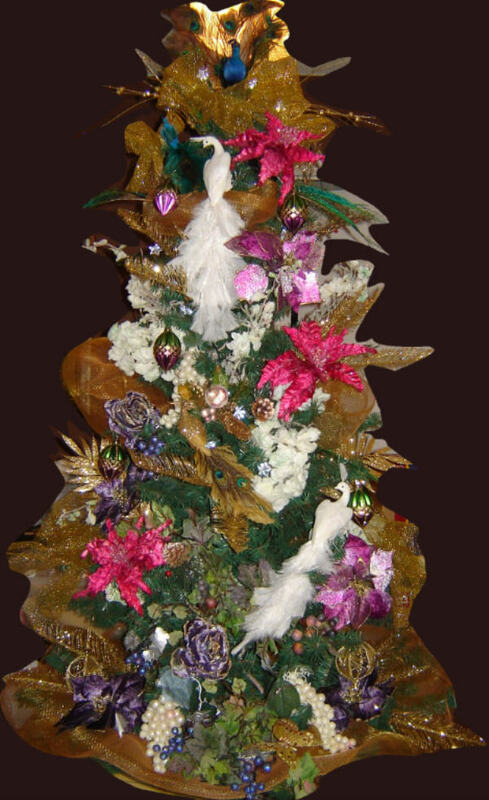 Imagine the perfect tree and we will create it for you up to 6 feet tall. 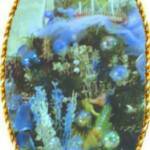 Our decorations and ornaments are exquisite, elegant and rich in quality and quantity. 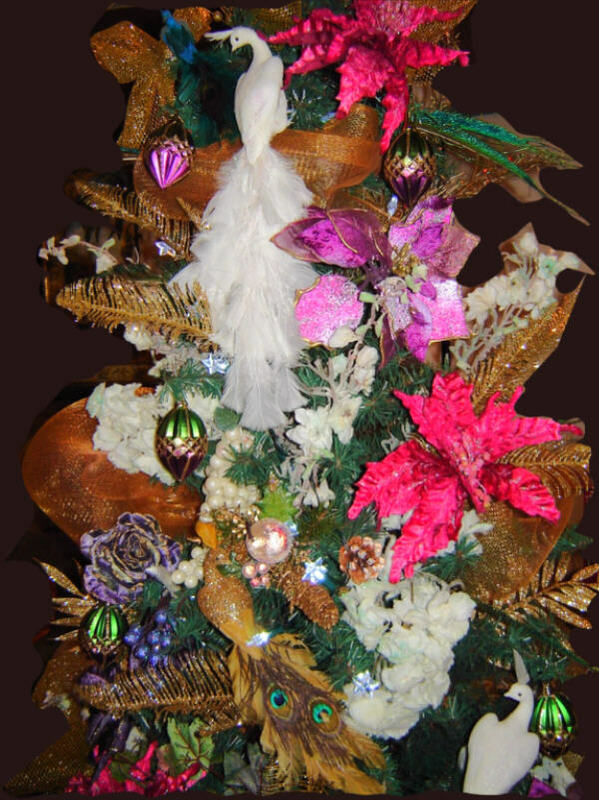 Each custom tree is unique especially if you tell us that you would like to emphasize some feature on it or perhaps have it match your room decor or accessories, or fit into a particular area or niche. 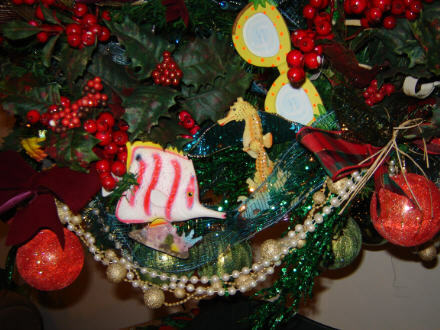 View some trees custom made to match the themes portrayed below, as well as the clients' reactions. We accept Credit Cards via 2CHECKOUT.COM, our on-line payment processing system, depending on the total dollar amount. Wire transfers also acceptable from your bank to ours. 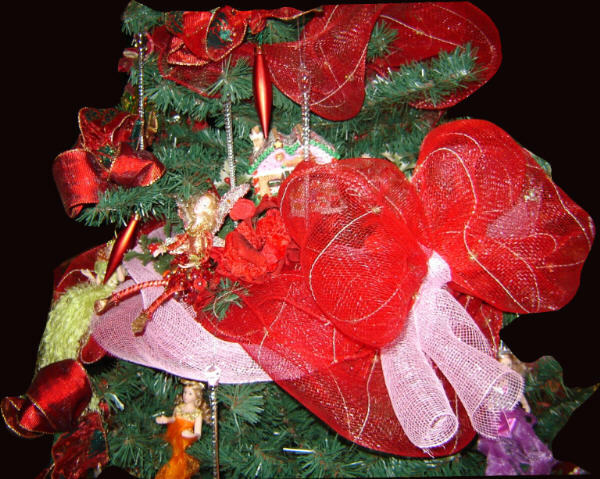 Certified bank checks or money order payments will delay the shipping of your decorated holiday tree by at least 10 days for check clearance. All information associated with your order must be verifiable, including email address, phone number, mailing addresses and billing information. Orders will not be shipped prior to verification. 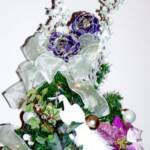 Please allow 2 business days (not including Saturday and Sunday) for on-line payment verification plus design and shipping time. 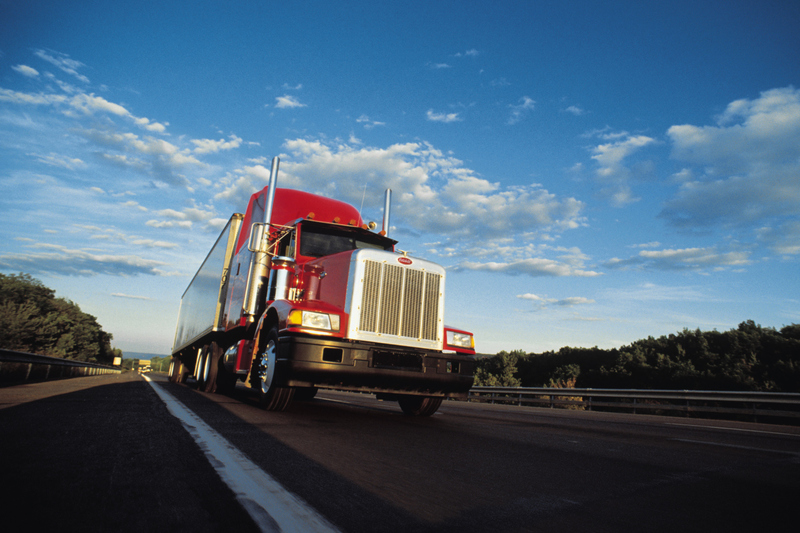 See forms of payment and shipping information for more details. Please contact us if you need rush shipping. 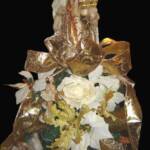 Goods and services provided by Royal Gift Basket Corp. (FL, USA). Sold by 2CheckOut.com Inc. (Ohio, USA). 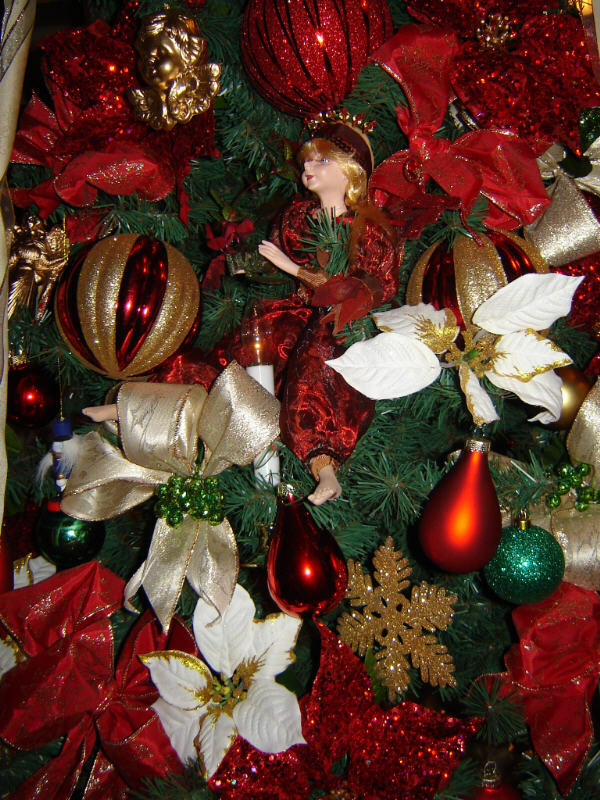 View Decorated Christmas Trees below. 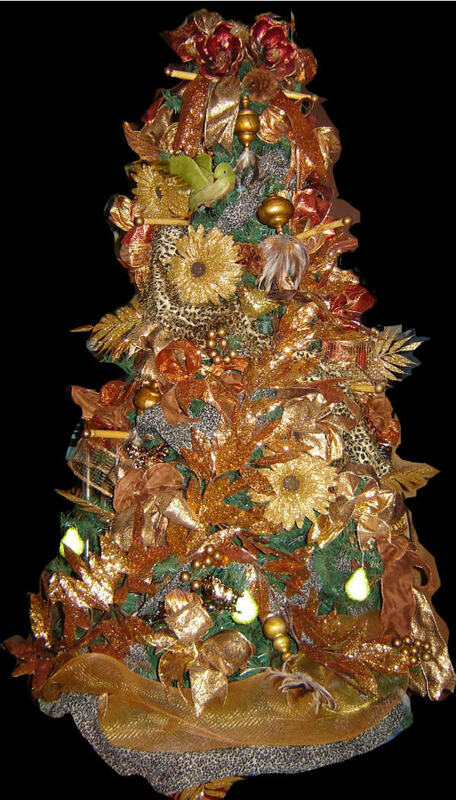 Lighted Tree Decorated With Lush Christmas/Thanksgiving Fruit and Green Foliage and golden ornaments and clear lights. 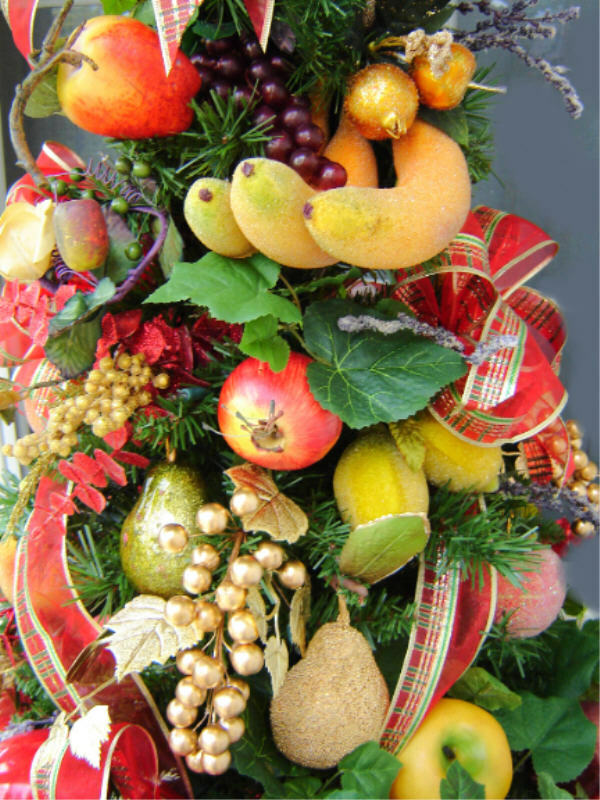 The fruit and foliage are artificial and cannot be consumed. Height 3ft. 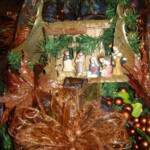 Price $599.00 includes shipping within the continental United States via Fedex Ground 5-7 day delivery. 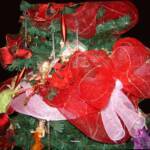 SELECT Christmas Tree Standard Shipping FREE in shopping cart. Click the button to place your order and pay through 2Checkout. We welcome your questions and comments. Please contact us if you have questions or need more information. If this is a gift for someone, please let us know. We can attach a card for you. 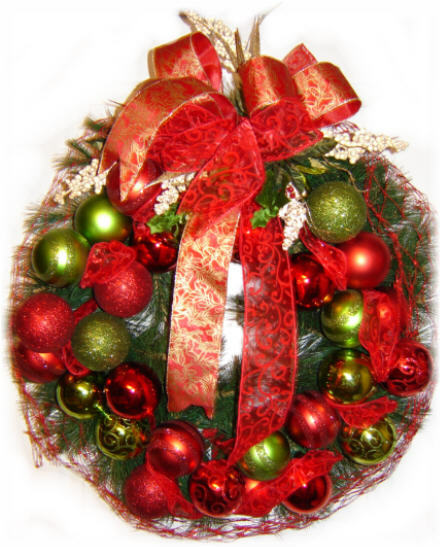 2CheckOut.com Inc. (Ohio, USA) is an authorized retailer for goods and services provided by Royal Gift Basket Corp..
Our company is located in South Florida, and all prices are in U.S. dollars. 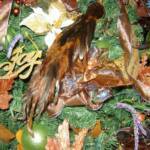 Recommended order time for custom designed trees, is ideally least 3-6 weeks prior to Christmas, December 25th. Prices shown here include shipping unless otherwise stated in a custom order. Select FREE at checkout. 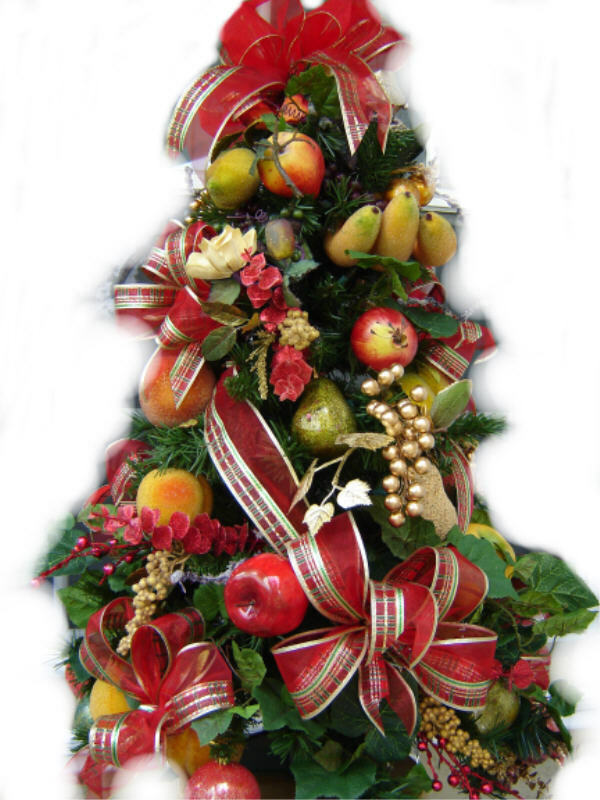 The tree will be shipped once payment in full is received and the design of the tree completed. We always communicate by email from the date of your order and throughout the design process. We require your approval of the finished design prior to shipment. 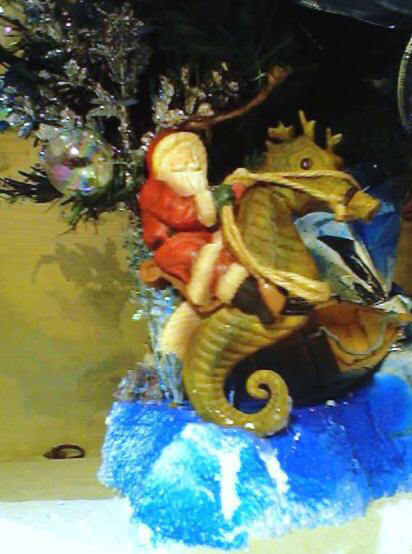 Usually our design and shipping time-line is 14 days. Please allow 2 business days for your on-line payment verification, once we have received your payment. West Coast States such as California and Washington usually receive their order on the 7th day after it has been shipped. East and Central States receive their orders within 3-5 days. Southern States such as Texas receive their orders within 5 days. International delivery is very costly, even though the carriers do deliver within a very short period of time, no more than 7 days. 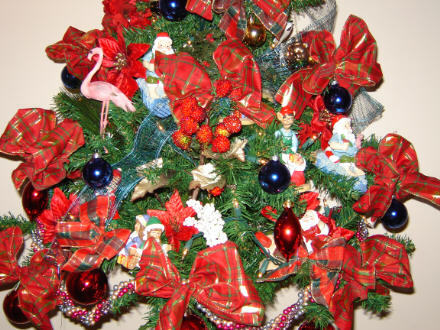 You can expect the price of shipping to any country outside of the continental USA, to be the same price of the tree. That has been our experience. 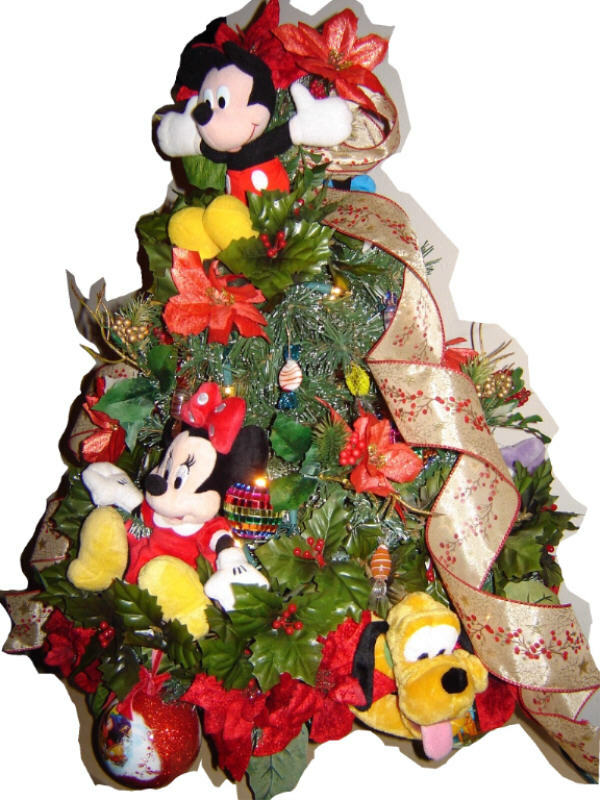 If the tree costs $300.00, it will cost $300.00 (U.S.) to ship it to Hawaii, Puerto Rico, Alaska etc. by UPS, FEDEX or DHL. Rush Delivery.... Please contact us regarding rush delivery. We will let you know if it is possible. 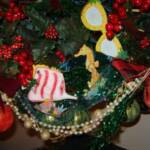 Bank Wire Transfer, Certified Bank Check, or Money Orders for custom designed trees are also options. We accept Credit and Debit cards. 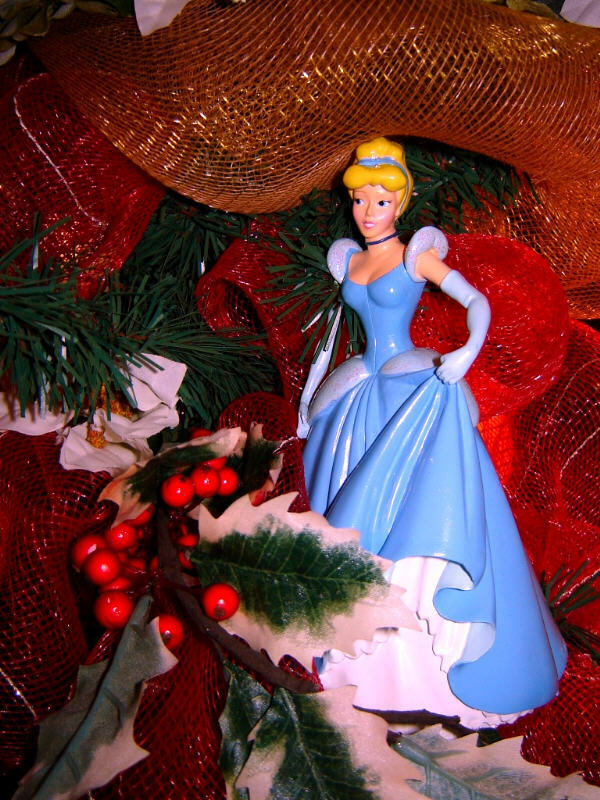 Payments made by regular mail, such as a check or money order will delay your shipping by at least 10 days or until the payment is cleared by the bank. 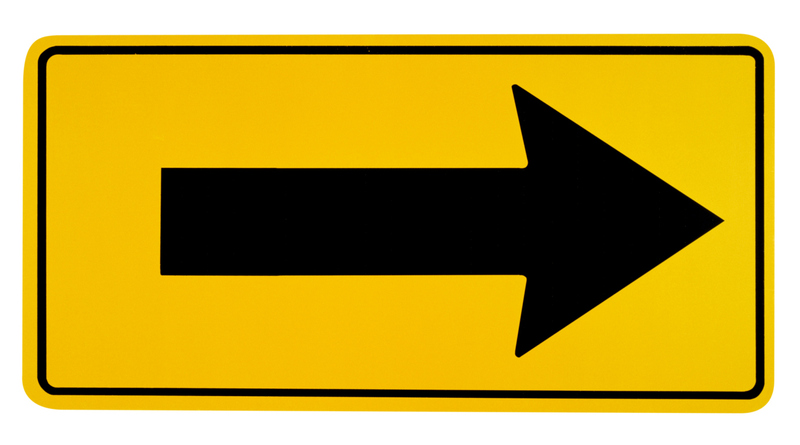 We reserve the right to accept or deny orders based on security issues. All information associated with your order must be verifiable, including email address, phone number, mailing addresses and billing information. Orders will not be shipped prior to verification by 2Checkout.com. Your privacy and the fulfillment of your order are protected by 2Checkout. 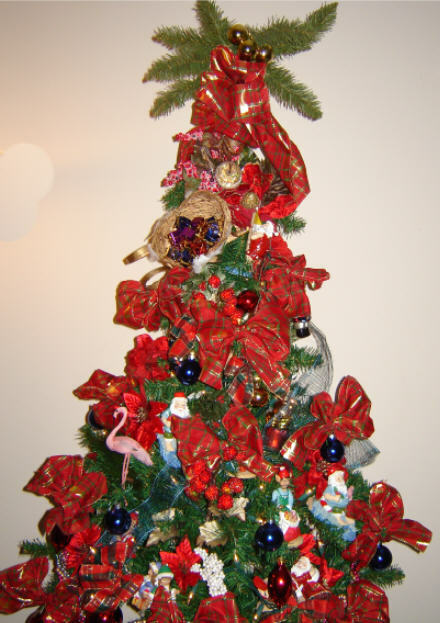 Once shipped the tree is non-refundable. Contact us to discuss payment options. 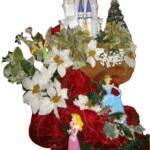 PLEASE NOTE: You may order any theme in any of the sizes from 2ft to 6ft. 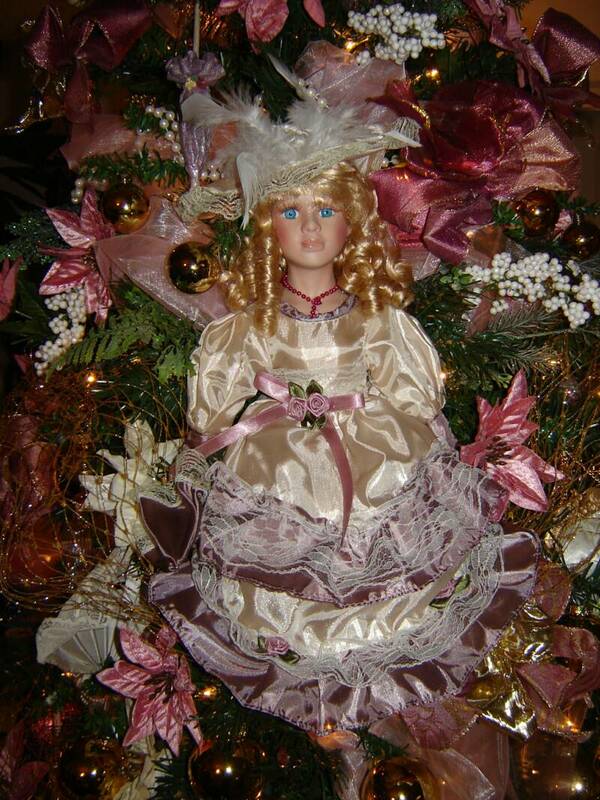 priced from $349.00 to $1299.00 including shipping within the United States. International shipping will be an additional charge. 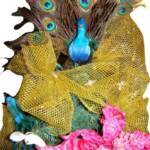 If the size you want is not shown here, please contact us for a custom order. Trees seen on this page are limited edition. All are currently available to purchase. 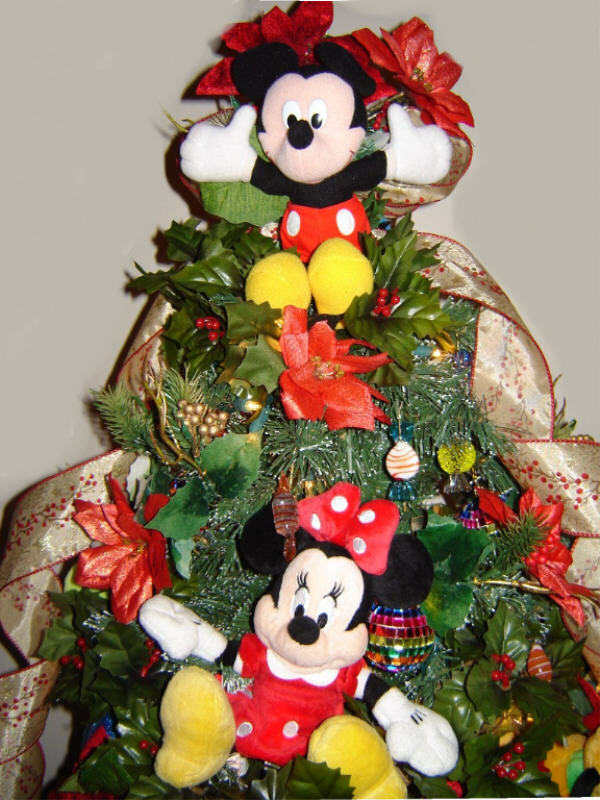 All the trees can be customized to suit you and we also design a theme that you have in mind. Please contact us if you have a question or need more specifics. 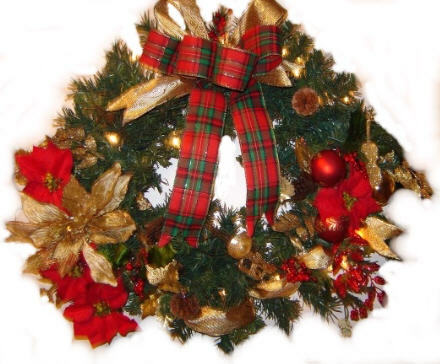 To Order a Special Customized Design Christmas Tree, Wreath or Garland please contact us and proceed to submit your request for a custom quote. 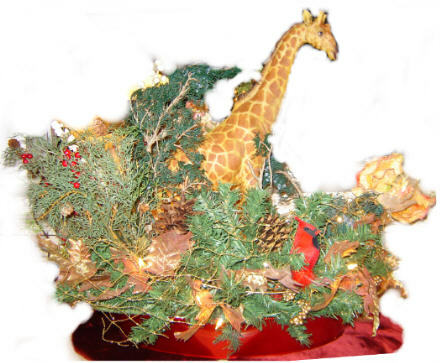 PLEASE NOTE: IF you pay an additional $50 we will be able to ship the 6 foot tall tree as one whole without any separation or sectioning, requiring no assembly. 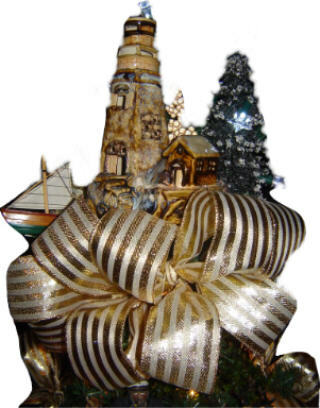 UPS will take it as an oversized package.CLICK THE BUTTON TO ADD OVERSIZED SHIPPING FOR 6FT TREES. 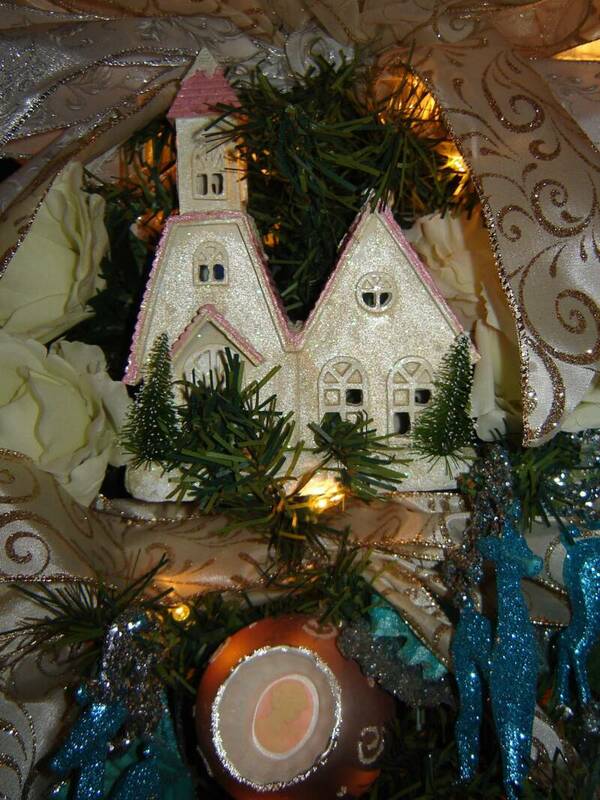 All trees are ARTIFICIAL and can be easily stored. 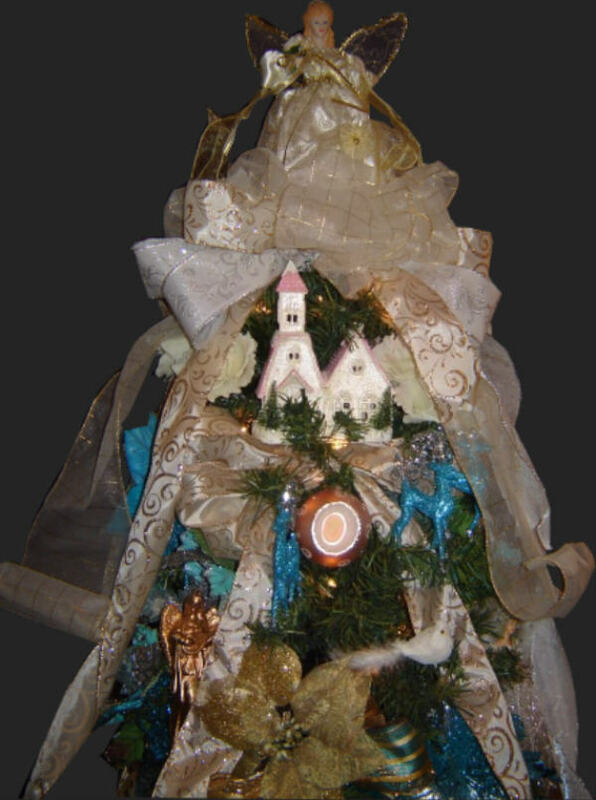 Display your custom tree for many years to come. 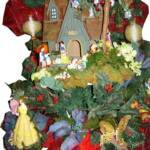 Theme may be colors, scenes or characters. 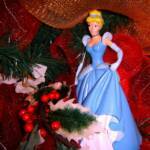 Characters are such as cartoon characters or movie stars, or even a special kind of doll. 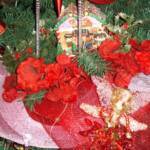 Trees may also have historical or religious themes, tell a story, or reflect a special holiday like Valentine's Day. Only the imagination is the limit! The cost of a character tree is determined by the actual character requested. 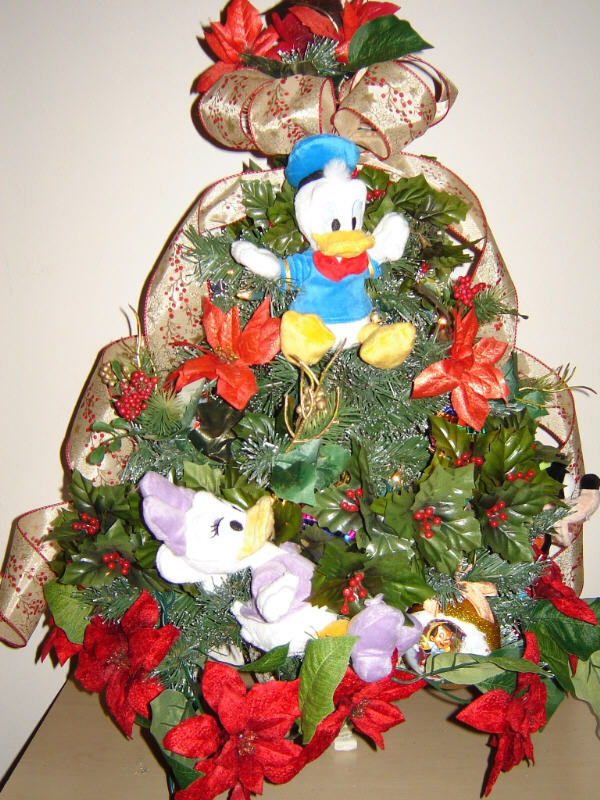 A tree decorated with Disney characters for instance is higher in price because we must purchase retail price characters for that particular tree. An example price range for a themed character tree is $349 to $2,500 depending on the size of the tree and the character theme of choice. Visit our Character Page. 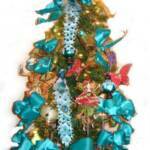 The Royal Caribbean Island Christmas Tree is one of a kind. 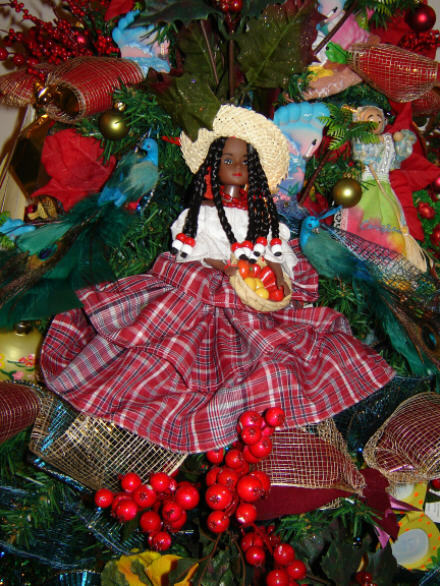 It represents the typical island in the Caribbean, such as Jamaica with it's beautiful doll dressed in the National Bandana Plaid fabric and cultural dress design. 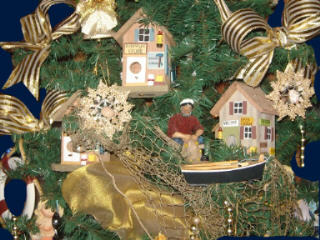 The ambiance of a tropical island is depicted in this tree with the tropical fish and various birds, including the Humming Bird or Doctor Bird which is the national bird of Jamaica, as well as peacocks, flamingos and parrots. 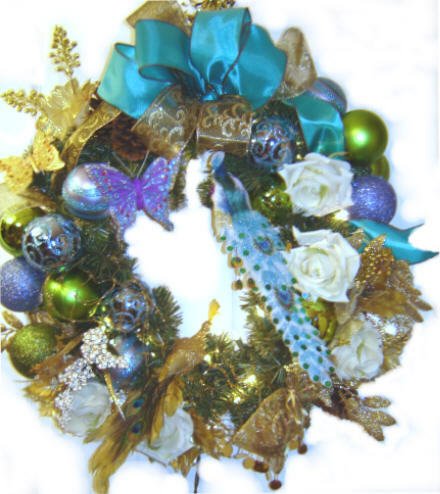 The underwater scenes with fish and sequined coral fans add brilliance and more azure color which is typical of the islands. 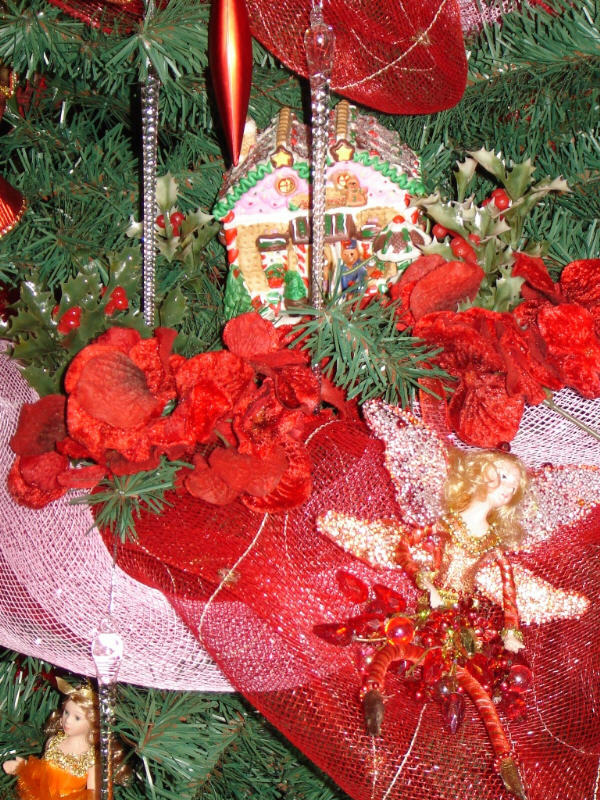 Red poinsettia and berries, pineapple and other tropical greenery as well as an assortment of red and green ball ornaments in various sizes and beaded pearl garland, adorn the tree, along with burgundy, red and sand colored bows. It is fully lit with clear lights and sits on a 3 prong stand. 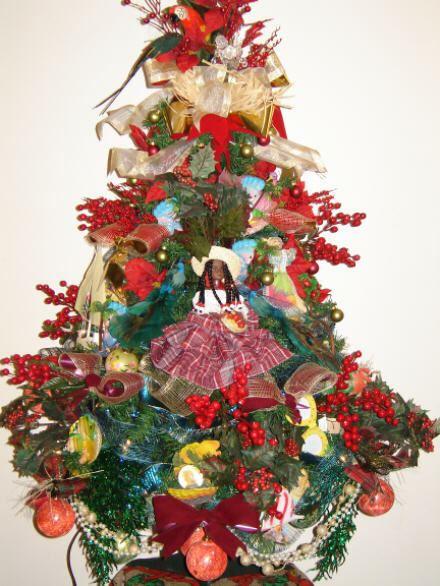 The tree is 6ft tall from the base to top. Price $1299.00USD includes shipping within the continental United States via Fedex Ground 5-7 day delivery. 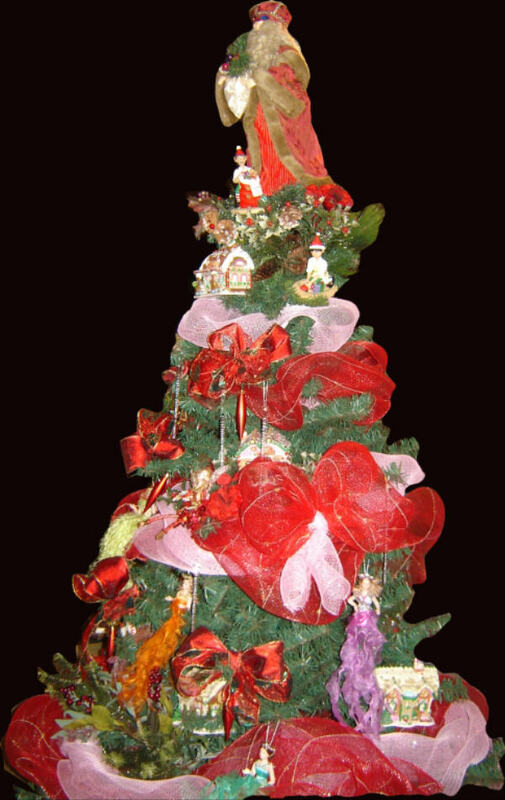 SELECT Christmas Tree Standard Shipping FREE in shopping cart. Subject to availability at time of order. Requires at least 12 days to design and ship. We welcome your questions and comments. Click the button to place your order and pay through 2Checkout. Please contact us if you have questions or need more information. If this is a gift for someone, please let us know. We can attach a card for you. 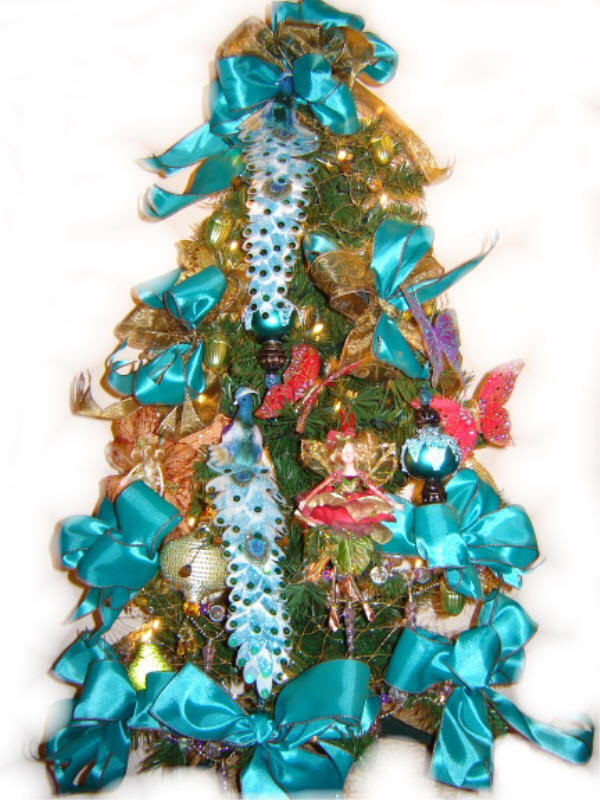 Exotic royal blue and shimmering green, sequined feathered peacocks, as well as colorful butterflies, and collectors heirloom fairies, adorn the tree. 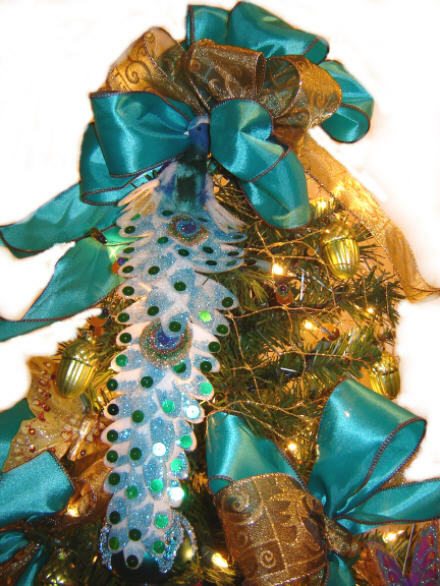 Aqua and sage green satin bows, lime green acorns and pears compliment them. 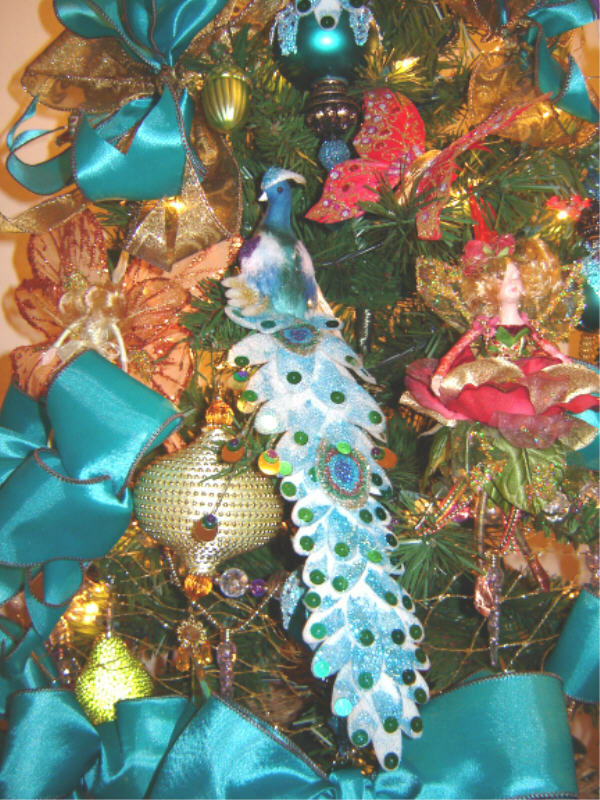 The top of the tree is also a peacock with the closed tail feathers surrounded by satin bows. The tree is fully lit with hundreds of clear lights. Height 3ft. from base to top. 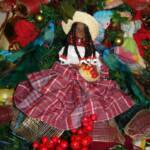 Price $599.00USD., includes shipping within the continental United States via Fedex Ground 5-7 day delivery. 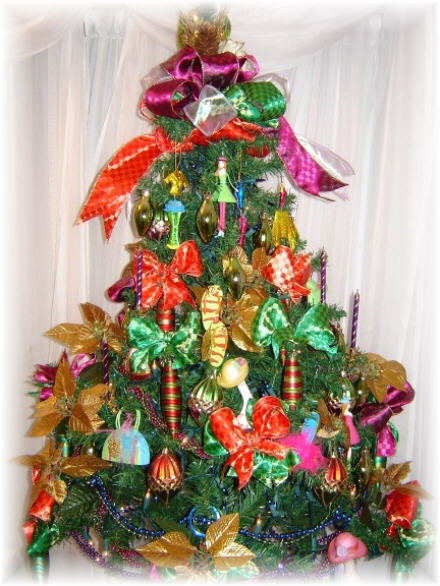 SELECT Christmas Tree Standard Shipping FREE in shopping cart. 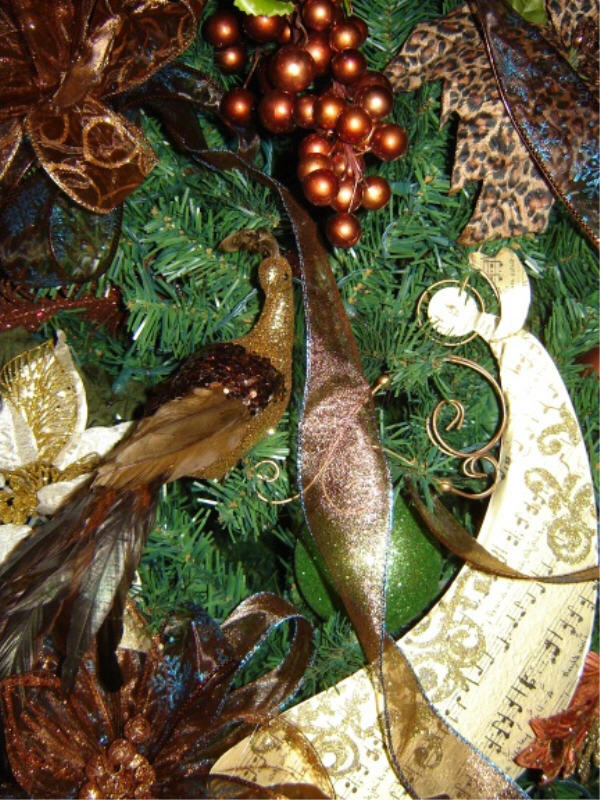 We recommend the Royal Peacock Christmas Wreath#2to match this tree design. 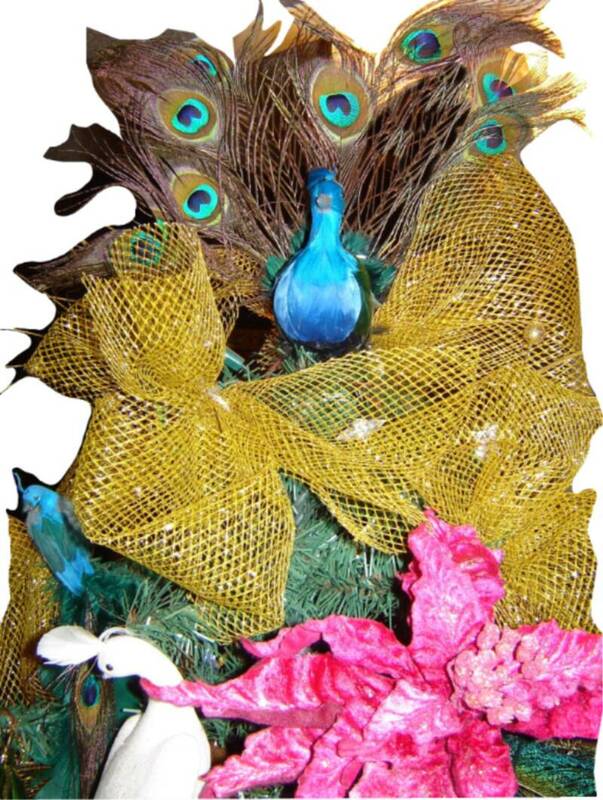 Royal Blue Peacock Garden Christmas Tree features beautiful royal blue and sea green peacocks as well as graceful pure white peacocks adorn this tree. 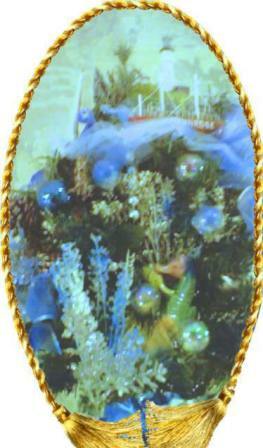 Royal blue and green peacock feathers, gold ornaments and brightly colored poinsettia and roses compliment them. 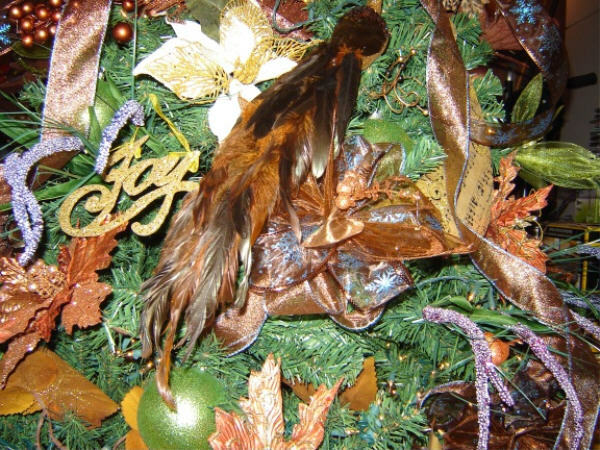 The top of the tree is also a peacock with the tail feathers spread out in a glorious display of color. The tree is fully lit with clear lights. Height 6ft. from base to top. Price $1299.00USD., includes shipping within the continental United States via Fedex Ground 5-7 day delivery. 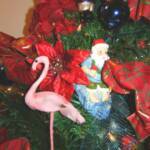 SELECT Christmas Tree Standard Shipping FREE in shopping cart. 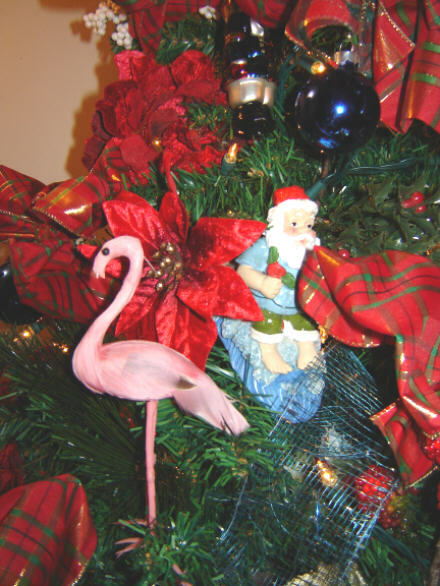 Tropical Santa figurine ornaments decorate the tree along with elves at work and other ornaments. 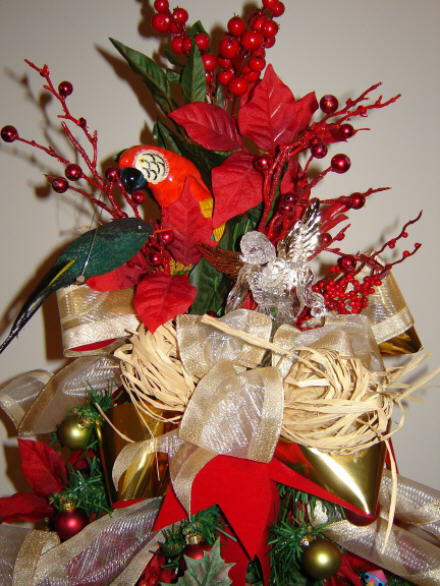 Decorations include red, green and gold fabric ribbon, royal blue ball ornaments and red ornaments, a palm tree topper with gold ball ornaments, a miniature sleigh, red poinsettia flowers and berries. 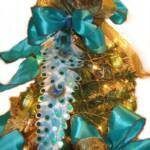 The tree is bejeweled in twisted pearl beading. 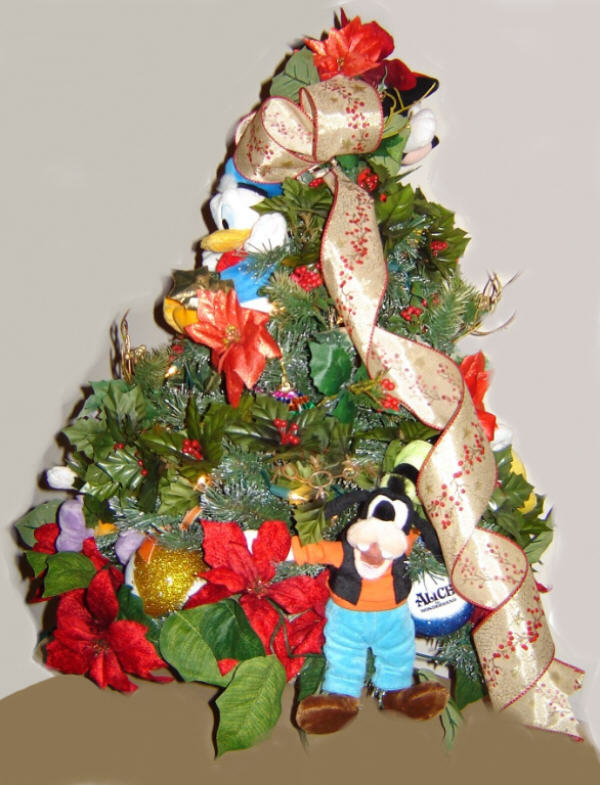 The tree is fully lit with hundreds of lights and comes with a special extension plug/cord for multiple light sets. Height 4 ft. Price $699.00 (U.S.) includes shipping within the continental United States via Fedex Ground 5-7 day delivery. 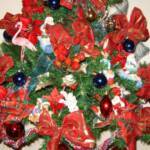 SELECT Christmas Tree Standard Shipping FREE in shopping cart. 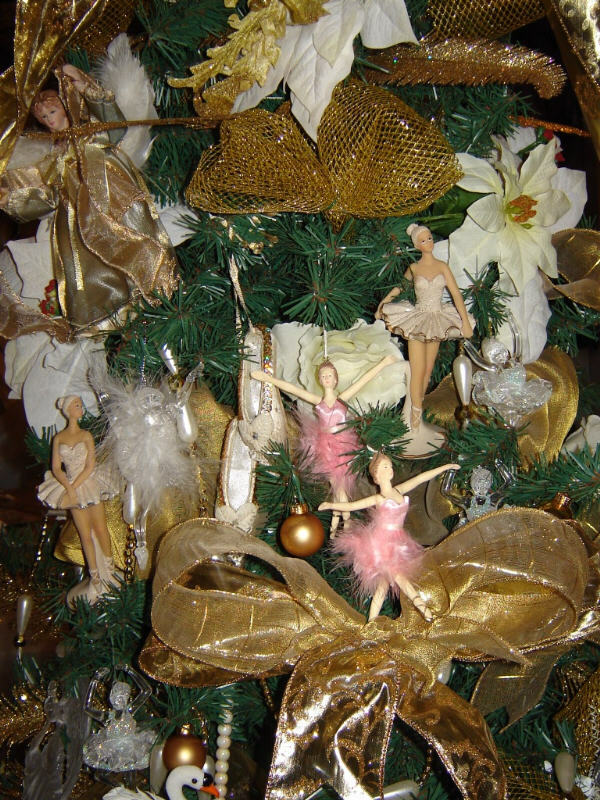 Royal Ballet Christmas Tree features ballerinas in pale pink and beige, crystal and ceramic, decorate this elegant tree. 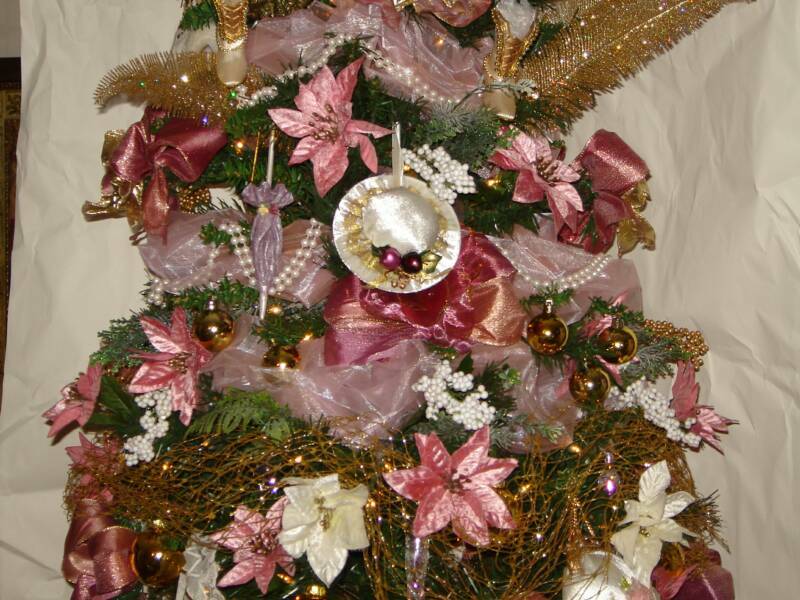 Decorations include creme, white and gold and pink ornaments gold brocade bows, Ancient Santa topper and white poinsettia flowers as well as creme and gold roses. 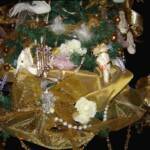 The tree is bejeweled in pearl and gold beading with crystal accent grapes, gold feathers, and gold ribbon. 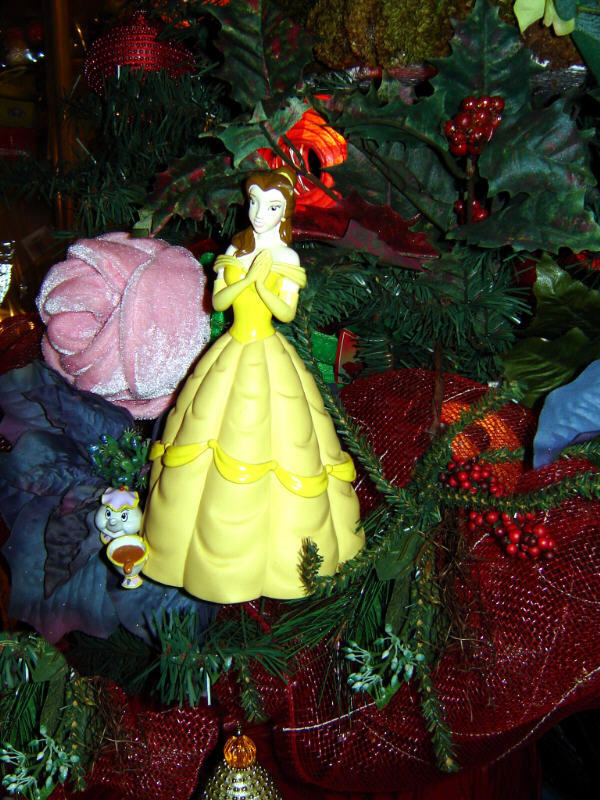 The tree is fully lit with hundreds of lights and comes with a special extension plug/cord for multiple light sets. Height 6 ft. Price $1299.00 (U.S.) includes shipping within the continental United States via Fedex Ground 5-7 day delivery. 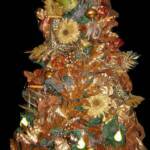 SELECT Christmas Tree Standard Shipping FREE in shopping cart. 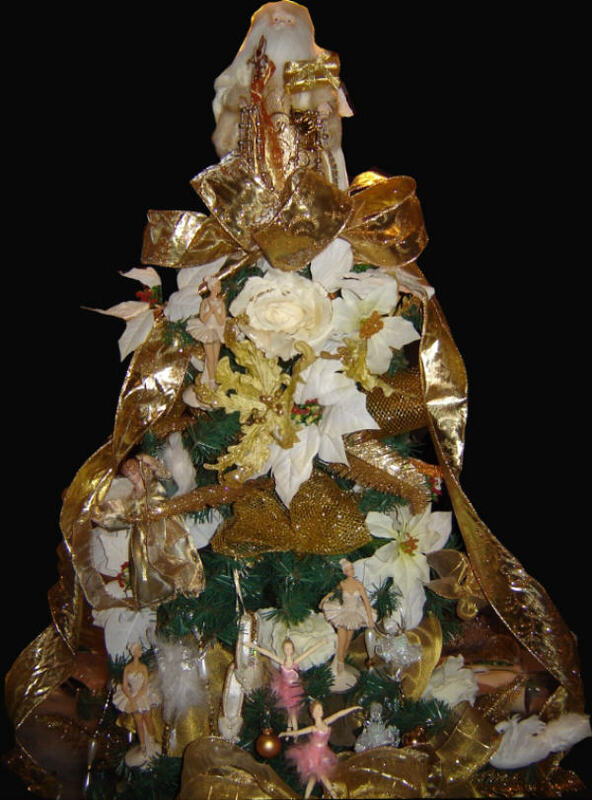 Royal Tradition presents a red, green and gold tree decked in beautiful bows, red and white poinsettia, red, gold and crystal accent ornaments, angels, green berries and balls and topped with a bountiful bow. 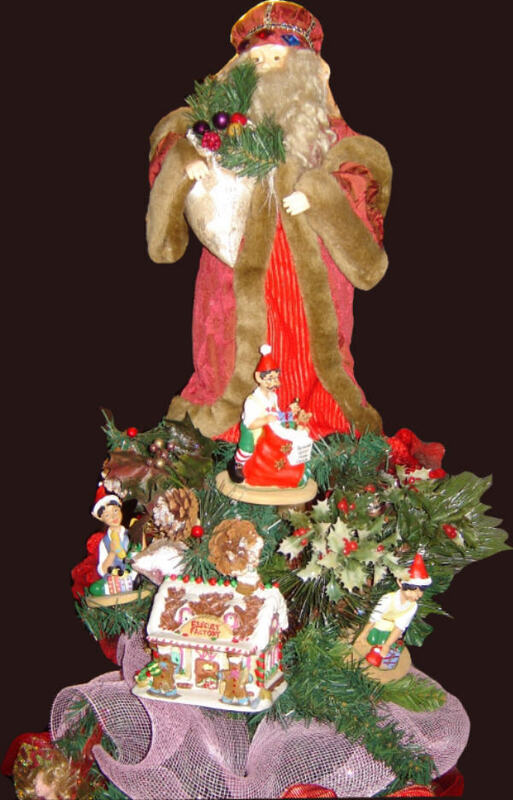 Includes ceramic Angels dressed in silk and crystal beading, wooden Nutcrackers, glass frosted icicles, a large rare fairy doll and a variety of other themed ornaments. 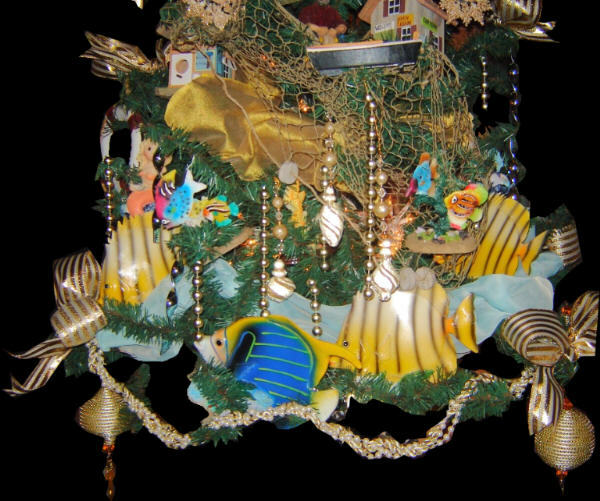 Includes hundreds of lights and a special multi-light set extension plug/cord. Height 6ft. Price $1299.00 (U.S.)includes shipping within the continental United States via Fedex Ground 5-7 day delivery. 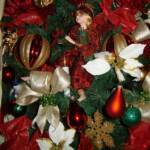 SELECT Christmas Tree Standard Shipping FREE in shopping cart. Subject to availability at time of order. Requires at least 12 days to design and ship. We welcome your questions and comments. Click the button to place your order and pay through 2Checkout. Please contact us if you have questions or need more information. If this is a gift for someone, please let us know. We can attach a gift card for you. 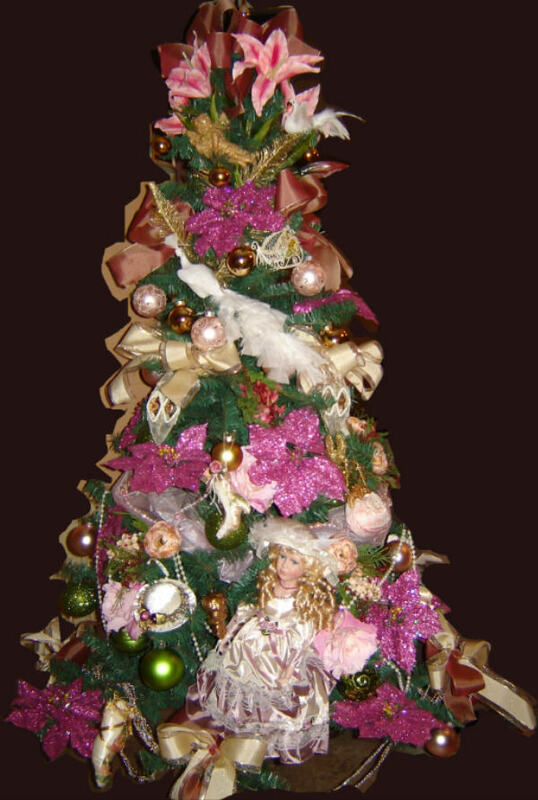 Ornaments of the Victorian era in various pinks, mauves, satin, crystal and ceramic, decorate this elegant tree. 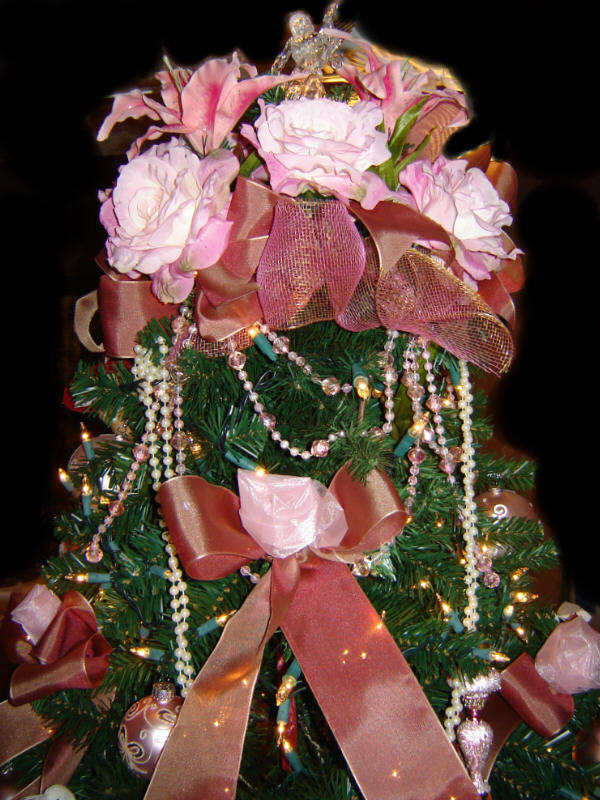 Decorations include white and gold and pink ball ornaments in 3 sizes, gold and pink bows. 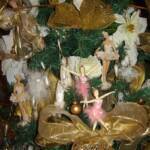 A rare Crystal-like Angel tops the tree which is dotted in pink poinsettia flowers as well as pink and gold roses. 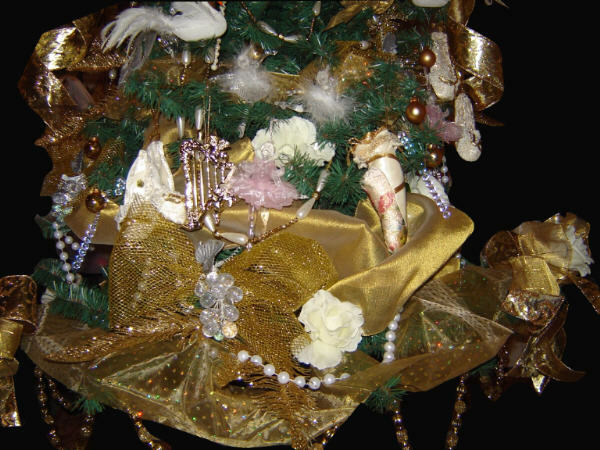 The tree is bejeweled and draped in twisted pearl and gold beading with gold and beige accents, gold feathers, and white baby's breath. The tree is fully lit with hundreds of clear lights and comes with a special extension plug/cord for multiple light sets. Height 6 ft. Price $1299.00 (U.S.) includes shipping within the continental United States via Fedex Ground 5-7 day delivery. 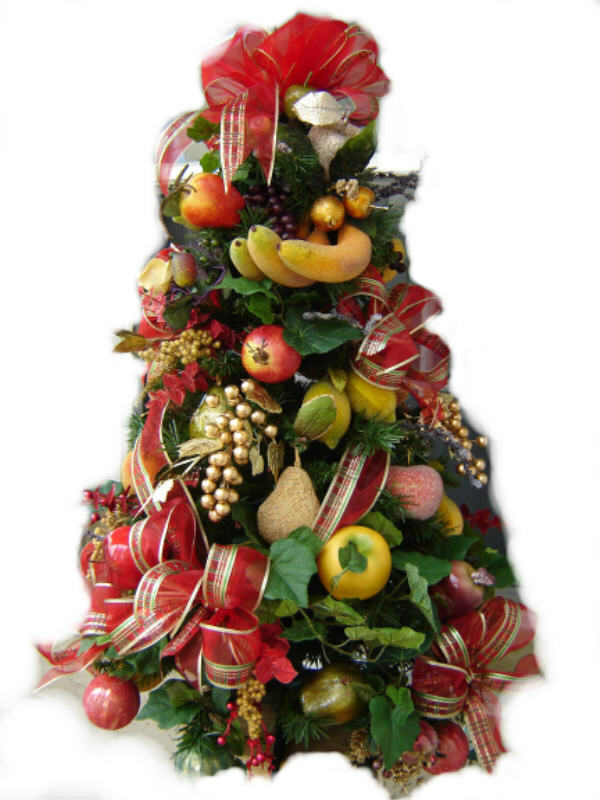 SELECT Christmas Tree Standard Shipping FREE in shopping cart. 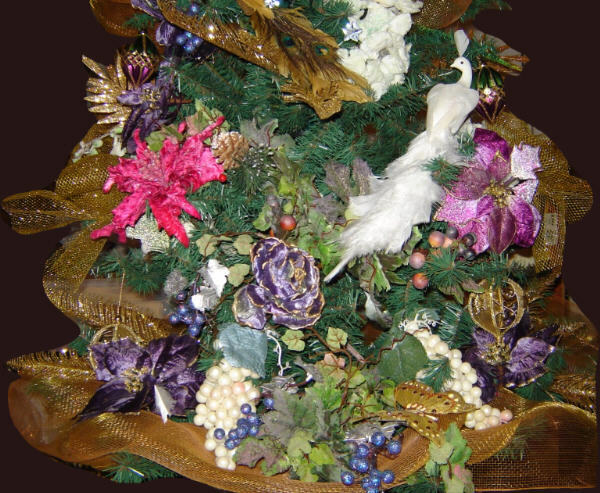 Royal Peacock Christmas Tree includes purple, mauve and sage green theme colors in beautiful bows, and rich silk floral and foliage decorations, with gold and white accent balls. 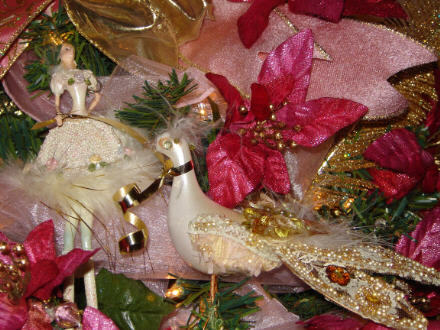 The realistic white peacock adds the crowning glory to this elegantly decorated tree. Includes hundreds of clear lights and a special multi-light set extension plug/cord. Height 4ft. Price $699.00 (U.S.)includes shipping within the continental United States via Fedex Ground 5-7 day delivery. 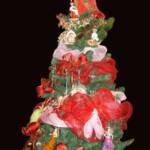 SELECT Christmas Tree Standard Shipping FREE in shopping cart. 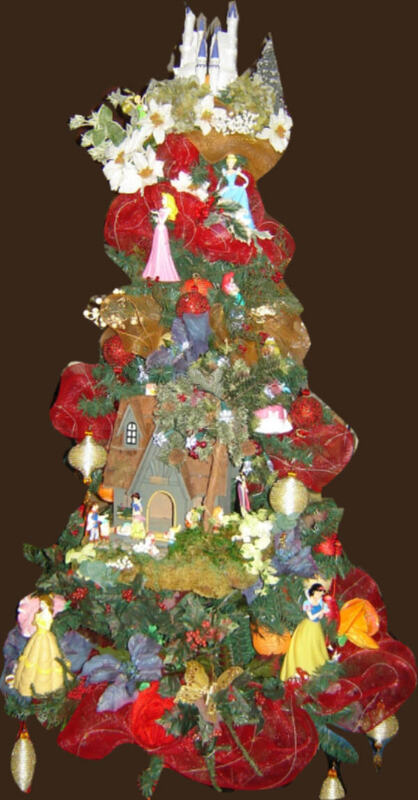 Royal Elves, Fairies and Santa Claus adorn this Holiday tree. 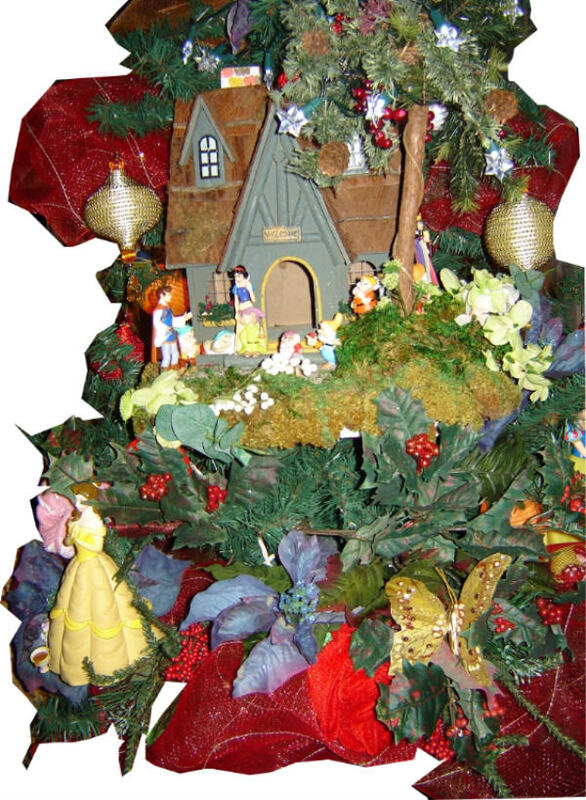 Ceramic fairies and elves, fruit, greenery flowers are the decorations arranged in this unique, elaborate and lush holiday tree. This tree is fully lit with hundreds of clear lights. Height 6 ft. Price $1299.00 (U.S.) includes shipping within the continental United States via Fedex Ground 5-7 day delivery. 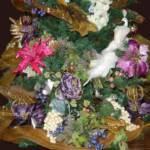 SELECT Christmas Tree Standard Shipping FREE in shopping cart. 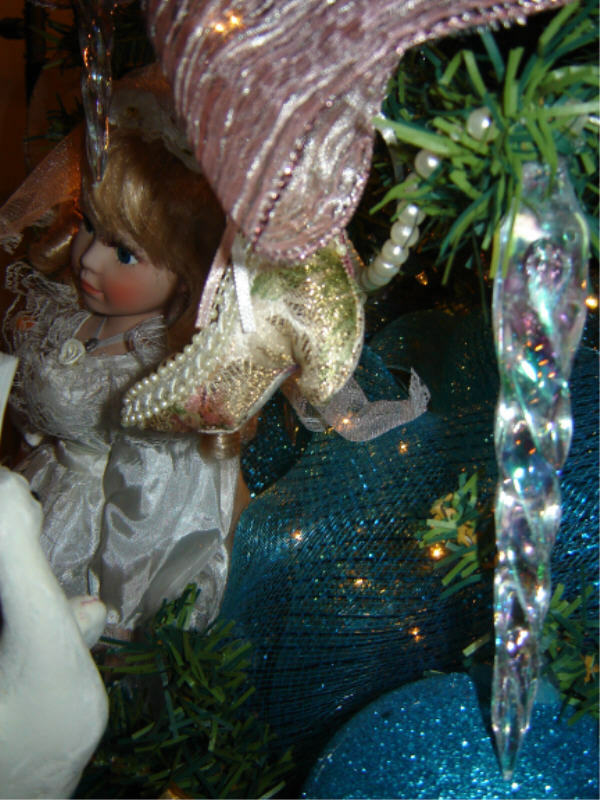 Lighted Under The Sea in a Christmas Tree with a topper simulating a northern shore. 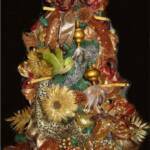 Perfectly handcrafted decorations unique, elaborate and one of a kind, adorn this tree. The tree is lit with clear lights. 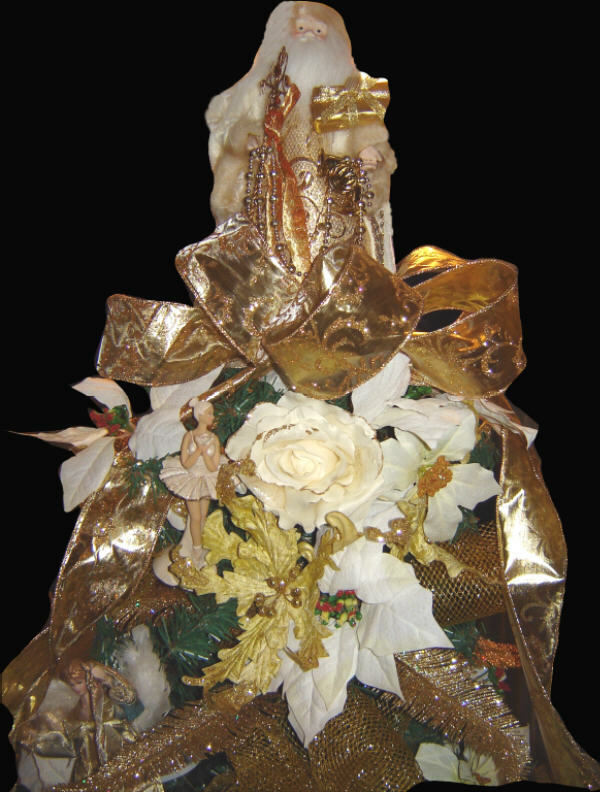 Height 2 ft. Price $349.00 (U.S.) includes shipping within the continental United States via Fedex Ground 5-7 day delivery. 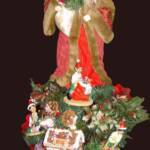 SELECT Christmas Tree Standard Shipping FREE in shopping cart. 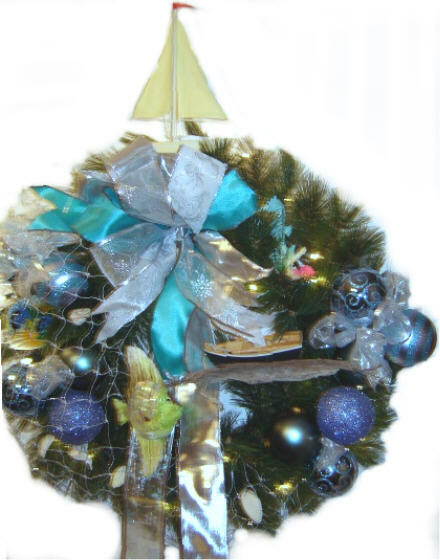 Lighted nautical theme includes an assortment of delightful nautical ornaments including row boats, fish sea creatures, bait and tackle shops and silk plant greenery, pearl beading wave like fabric and a light house topper. 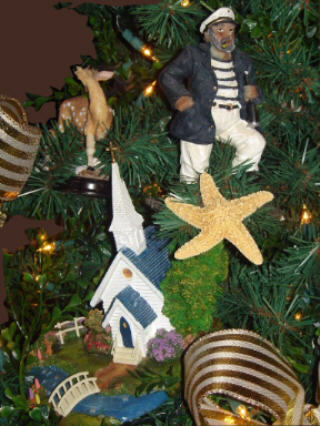 It sits in a wooden boat for a finished effect. 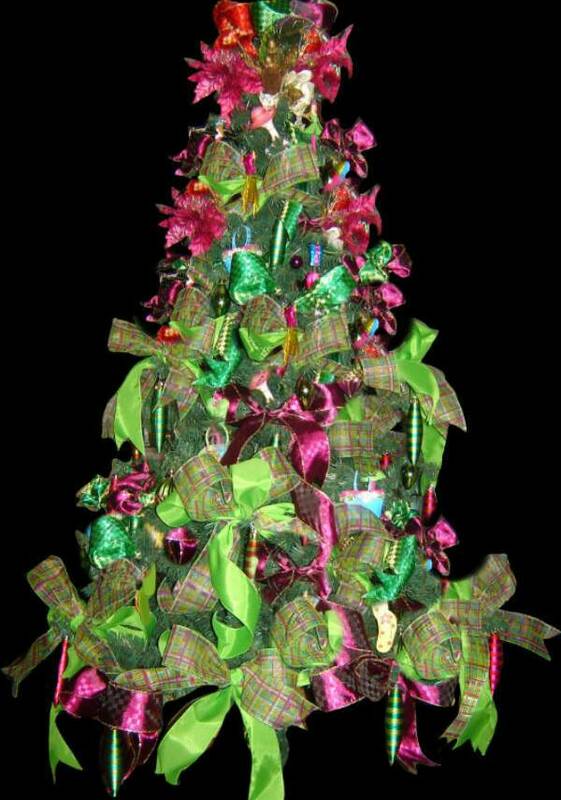 The tree is fully lit with hundreds of clear lights and comes with a special extension cord for multiple light sets. Height 6Ft. Price $1299 (USD) includes shipping within the continental United States via Fedex Ground 5-7 day delivery. 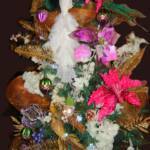 SELECT Christmas Tree Standard Shipping FREE in shopping cart. 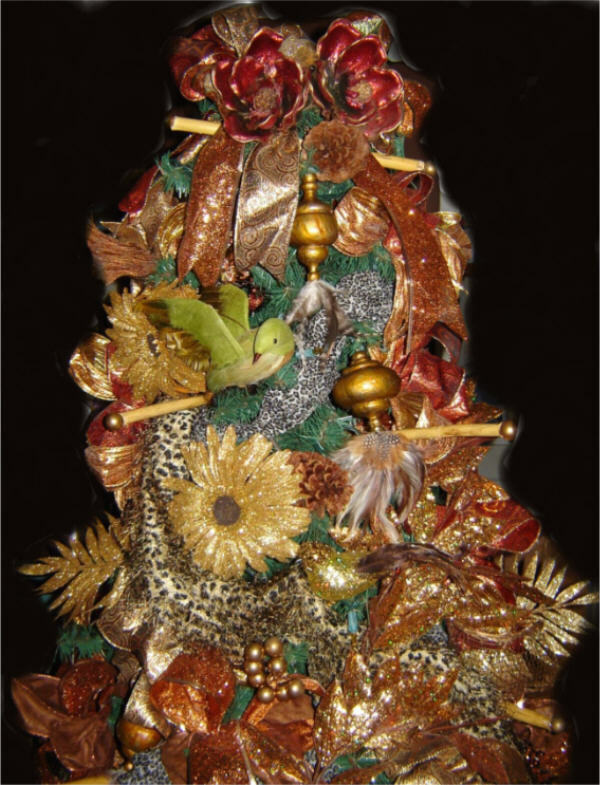 Lighted Safari Theme Tree includes a rich assortment of copper and gold and bamboo ornaments, feathers, with rich safari print sheer fabric, birds, grape clusters and gilt edged roses. 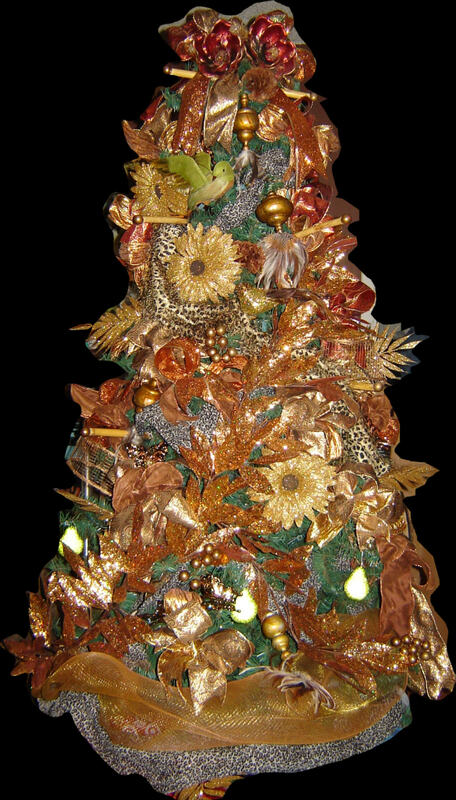 The tree is lit with hundreds of amber and clear lights and comes with a special extension cord for multiple light sets. Height 6 ft. Price $1299.00 (U.S.) includes shipping within the continental United States via Fedex Ground 5-7 day delivery. 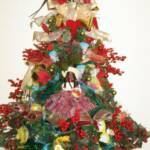 SELECT Christmas Tree Standard Shipping FREE in shopping cart. 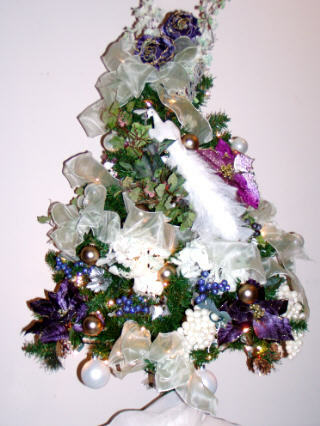 Lighted Holiday Character Or Valentine Tree with themed ornaments and mini poinsettia vines and clear lights. 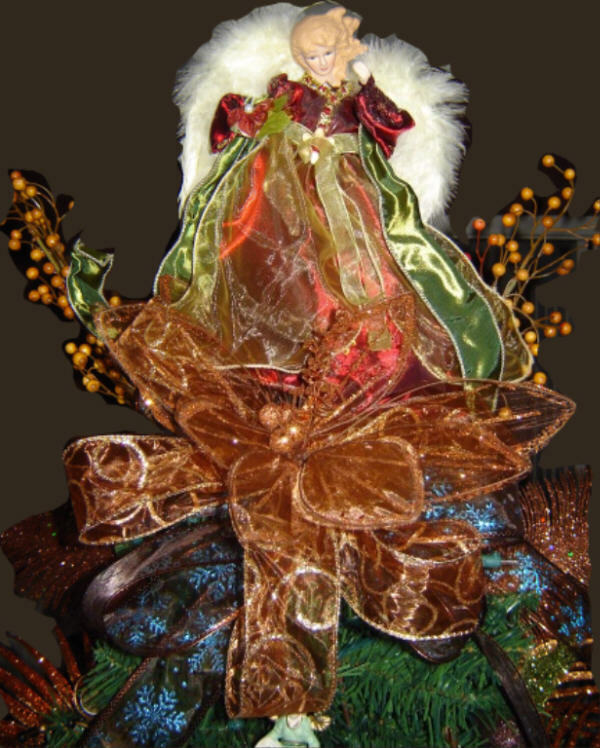 Height 2ft.Price $349.00 (U.S.) includes shipping within the continental United States via Fedex Ground 5-7 day delivery. 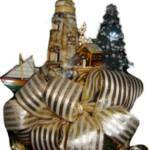 SELECT Christmas Tree Standard Shipping FREE in shopping cart. 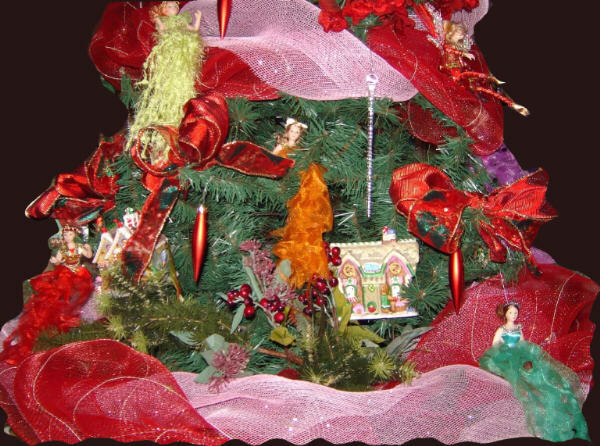 Royal Tradition 2 ft Tree is a miniature of the 6ft version, with red, green and gold decorations in beautiful bows, ball ornaments gold roses, and other gold and red accents and is fully lit with clear lights. Price $349.00 (U.S.)includes shipping within the continental United States via Fedex Ground 5-7 day delivery. 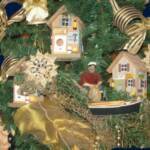 SELECT Christmas Tree Standard Shipping FREE in shopping cart. 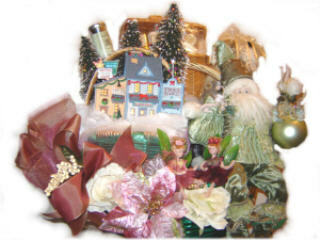 DECORATE YOUR EVENTS is the online decorating division of Royal Gift Basket Corp. Please do not mail any payments without verification of your order status from us by email . Tell your friends about this site. 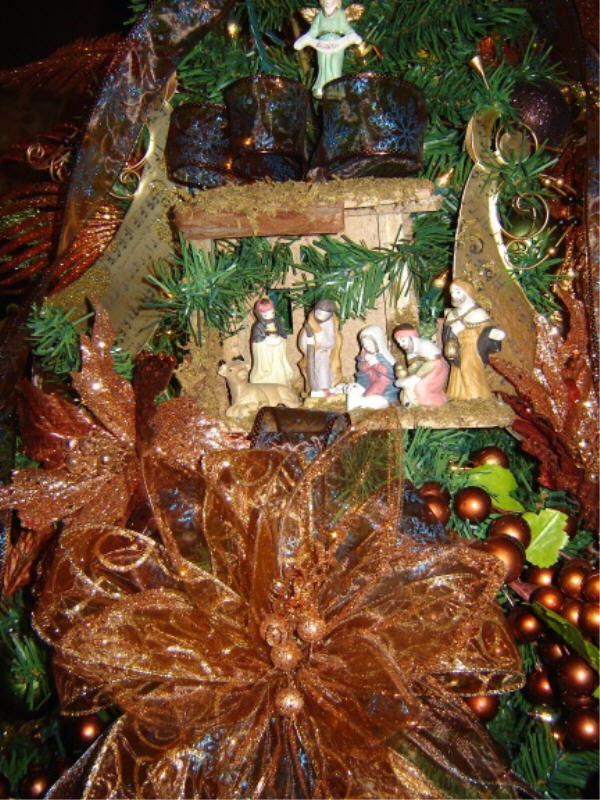 Lighted Holy Land Christmas Theme Tree includes a rich assortment of copper and gold ornaments, and is topped with a manger scene, with Mary and Joseph and the baby Jesus. 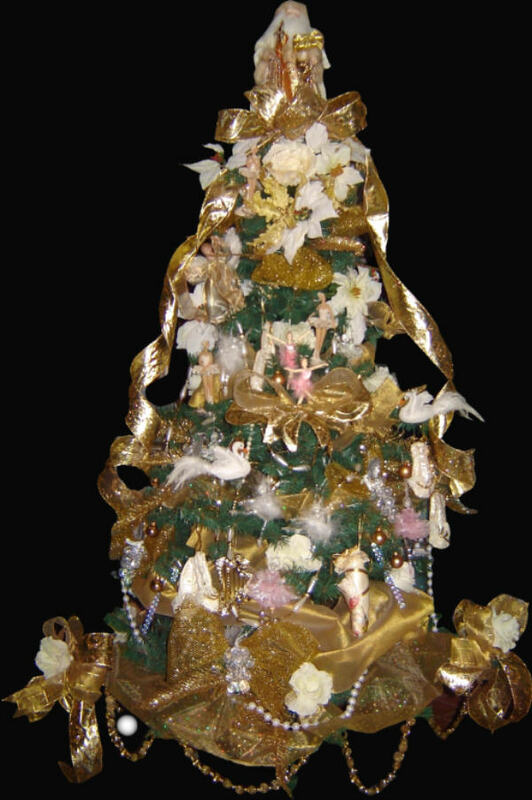 Angels, spiritual and religiously inscribed plaques, birds, peacock, grape clusters, rich brocade bows and gold and copper poinsettia also adorn the tree. 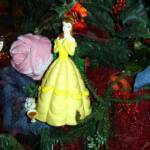 The tree is lit with hundreds of clear lights and comes with a special extension cord for multiple light sets. Height 6 ft.
Price $1299.00 (U.S.) includes shipping within the continental United States via Fedex Ground 5-7 day delivery. 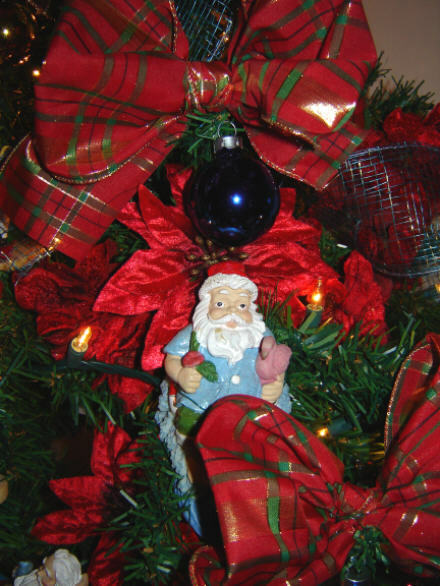 SELECT Christmas Tree Standard Shipping FREE in shopping cart. 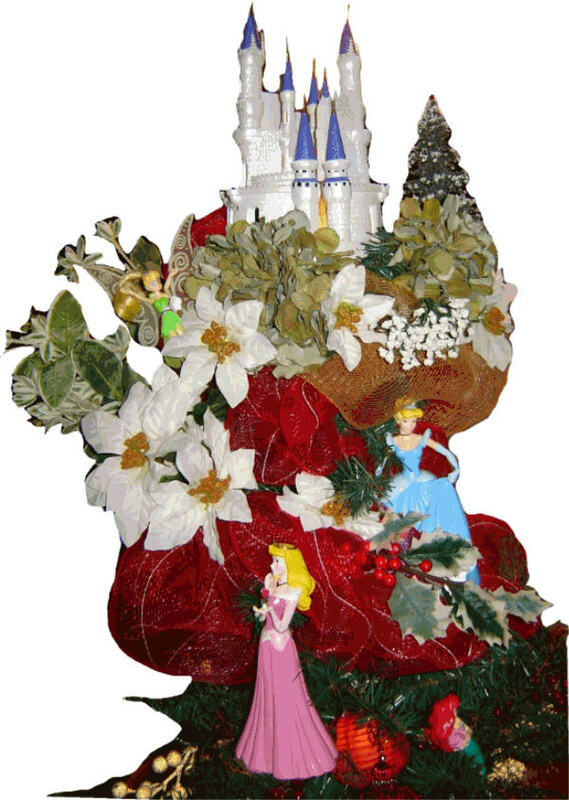 Lighted Fairytale Princess Theme Christmas Tree includes a variety of Disney princesses and features a scene from Snow White and the seven dwarfs. 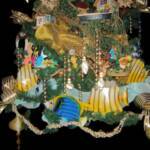 The tree is topped with a Cinderella castle scene. The tree is lit with oriental lanterns and clear lights. Height 6 ft. Price $1299.00 (U.S.) includes shipping within the continental United States via Fedex Ground 5-7 day delivery. 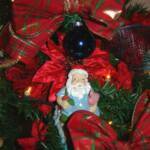 SELECT Christmas Tree Standard Shipping FREE in shopping cart. 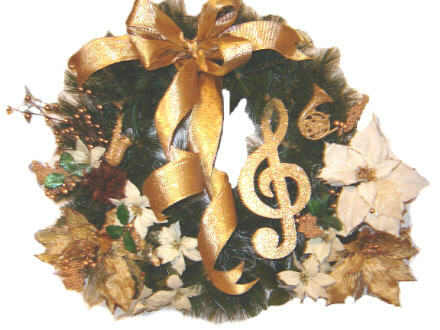 We custom design the tree or wreath in various sizes. See "OTHER SIZES". 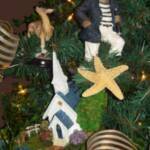 Please let us know if you would like to change something such as the topper on the tree, just send us an email. 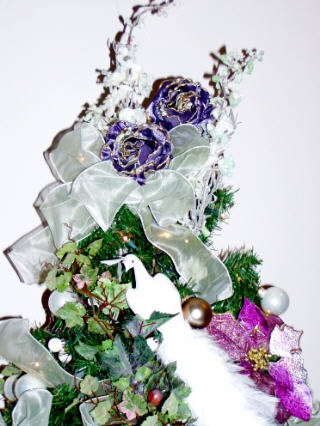 We can also customize a Christmas tree to suit your ideas. 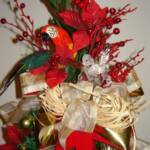 Choose the colors and the theme to match your decor or an event. Buy for yourself or as a gift for someone else. 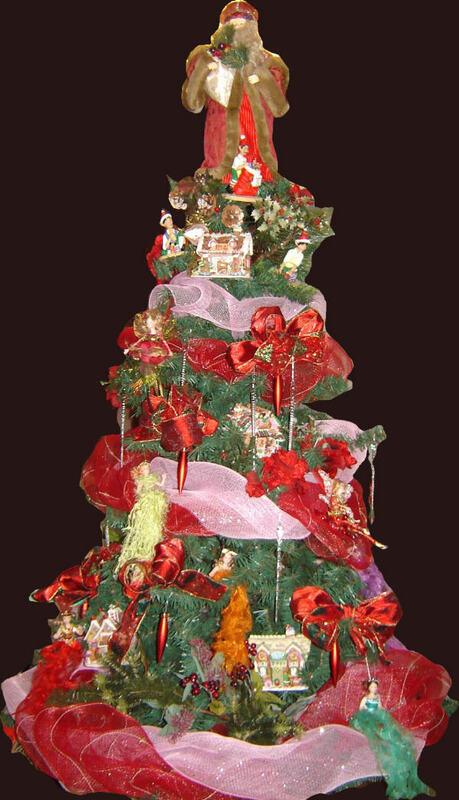 The decorated Christmas trees seen here are our basic standard designs, which are improved upon every year as newer more beautiful and intricate decorations are discovered by our buyer and designer. Take a look at the Hall of Fame photos and comments pages to see how the trees have evolved over the years. 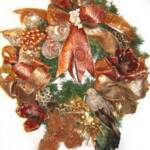 Prices include UPS or Federal Express Ground Shipping of 5-7 business days within the Continental United States. 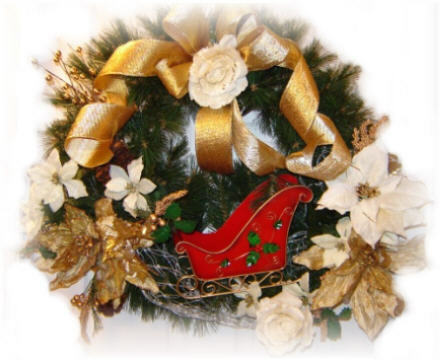 We recommend that Trees and wreaths should be ordered 3-4 weeks prior to desired delivery date. See shipping. 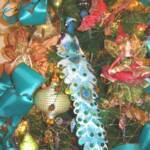 Brilliant colors and bold style make this Fashion Glamour Christmas Tree stand out in the crowd. 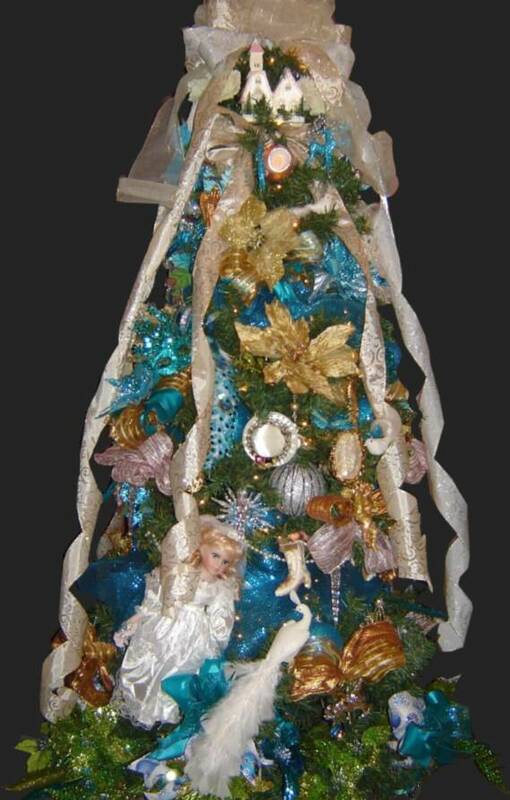 It sparkles with hundreds of lights and a variety of shapely color coordinated ornaments. 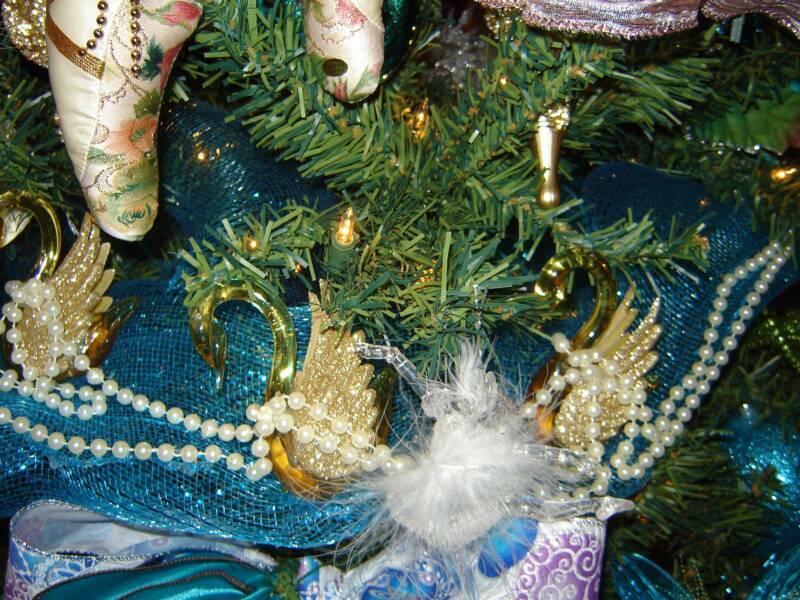 The stylish girl, graceful neck and head with the hat, feathered high heel pumps, beach sandals and handbags, are just a few of the rare ornaments on this tree. Modern Colorful and Fashionably Fun describe this Christmas tree which is decorated with Feminine Fashion Stylish ornaments and colorful satin bows. 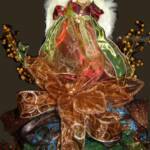 Perfect for a fashion design house, clothing store or lady who loves couture fashion. Brilliant colors brighten any room. 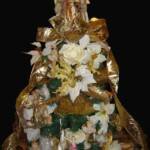 It is also decked with colorful beading and beautiful satin bows, with large bows mixed with flowers for the topping. 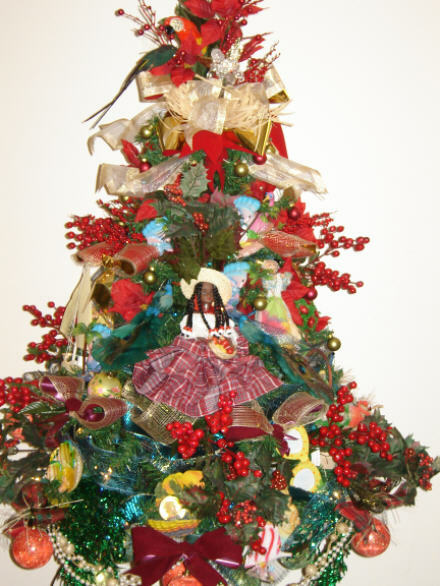 The tree is 6ft tall from the base to top. Price $1199.00USD., includes shipping within the continental United States via Fedex Ground 5-7 day delivery. 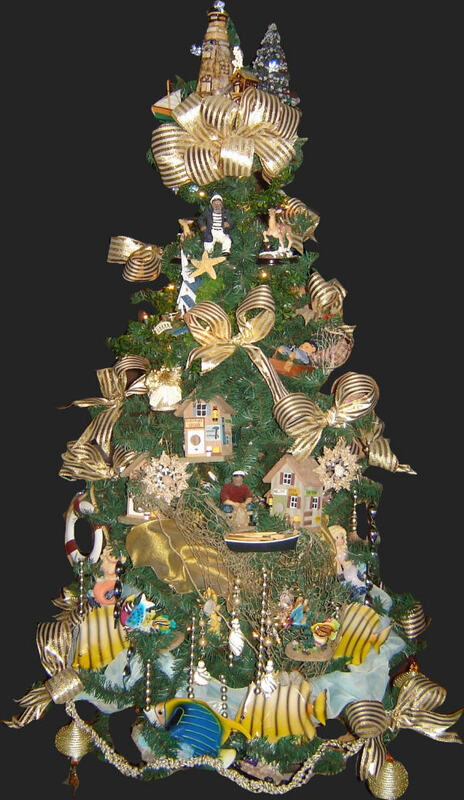 SELECT Christmas Tree Standard Shipping FREE in shopping cart. 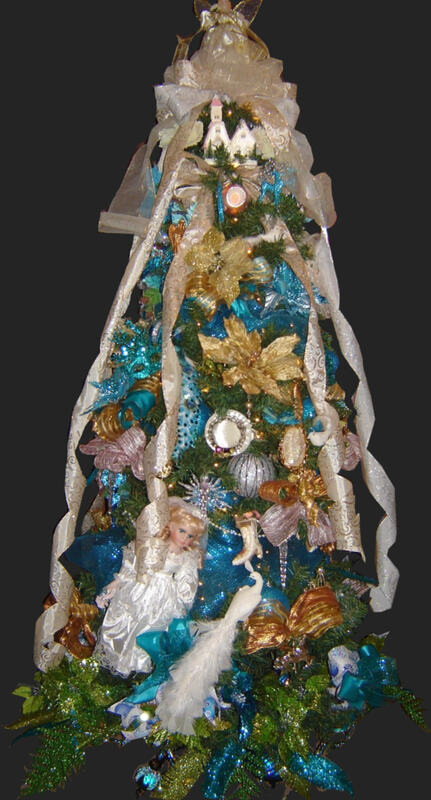 Ornaments of the Victorian era in azure blue, copper, gold, satin, crystal and ceramic, decorate this elegant tree. 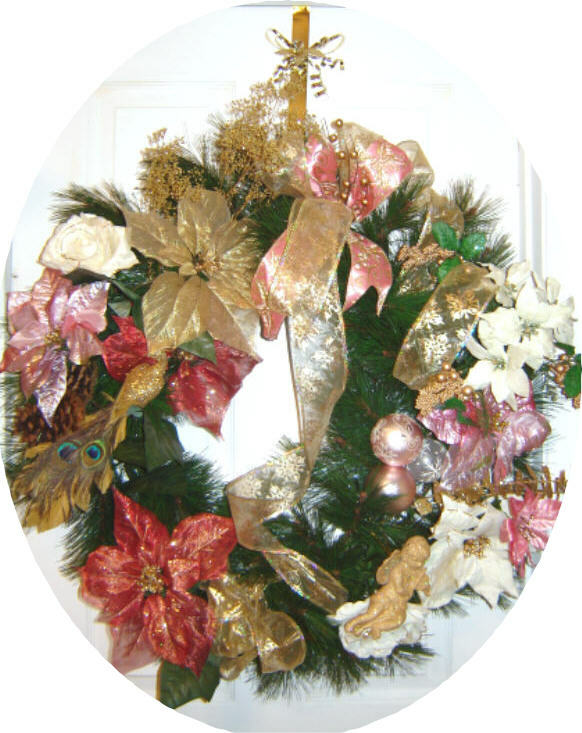 Decorations include blue, green, copper, gold and pink ball ornaments, copper and gold bows. The tree is fully lit with hundreds of clear lights and comes with a special extension plug/cord for multiple light sets. Height 6 ft. Price $1299.00 (U.S.) includes shipping within the continental United States via Fedex Ground 5-7 day delivery. 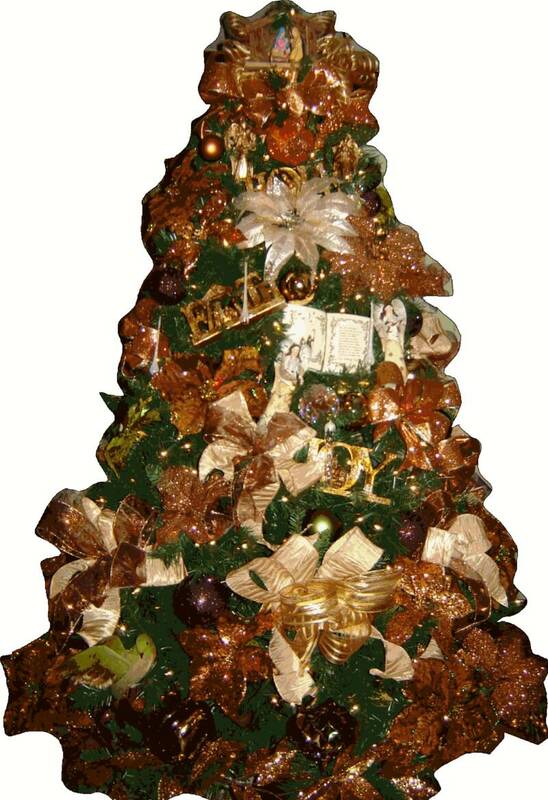 SELECT Christmas Tree Standard Shipping FREE in shopping cart. 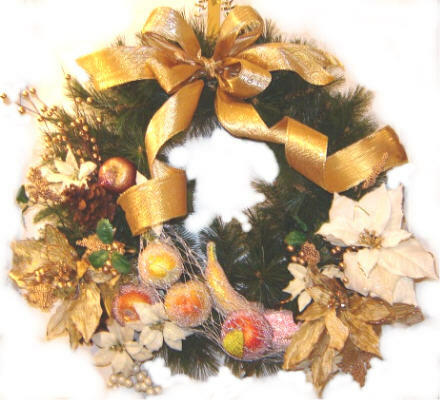 Click here to go to Decorated Wreaths. 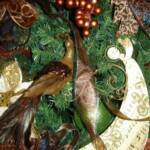 Please inquire about Decorated Garlands. 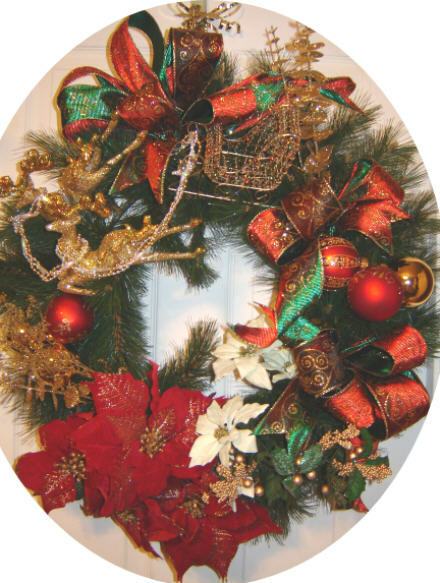 Preview the decorated Christmas wreaths here. Click the picture to enlarge. 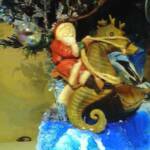 2Checkout.com Inc. (Ohio, USA) is a payment facilitator for goods and services provided by Royal Gift Basket Corp..